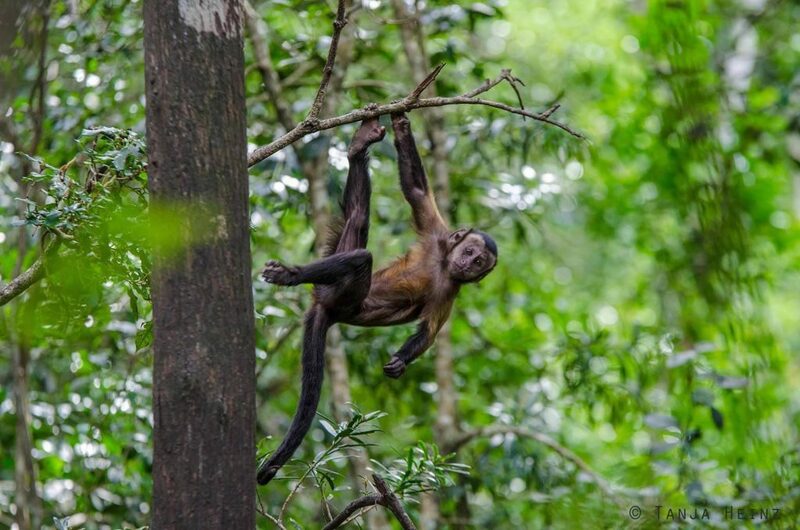 If you know my article about my unsuccessful searches for the Northern muriquis in the Feliciano Miguel Abdala Natural Reserve and for the marine turtles in the Parque Estadual de Itaúnas, then you can understand why I became open for every tip by Brazilians about where to observe wild animals. And one of those tips was the Reserva Natural Vale close to Linhares in Espírito Santo. 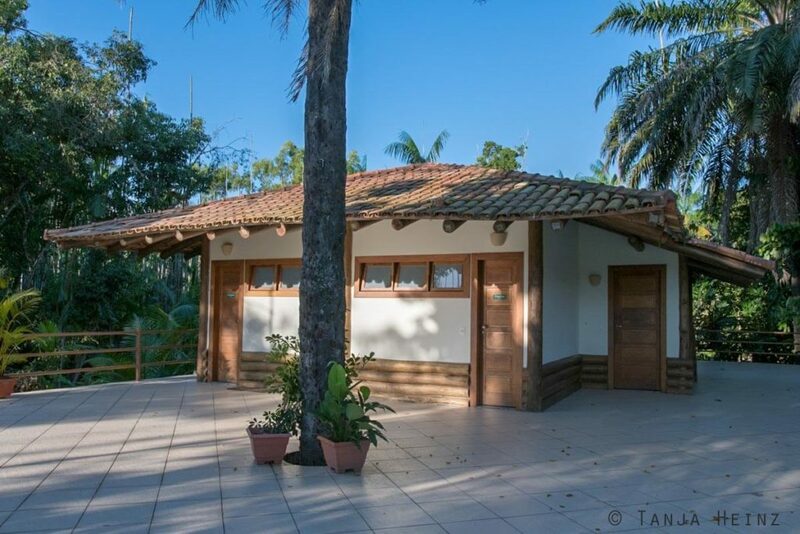 After our stay in Itaúnas me and Ricardo actually planned to travel to Vitória in order to visit the Projeto Tamar. For any reason I did not notice in my travel guide that there is the nature reserve Reserva Natural Vale close to Linhares in Espírito Santo. 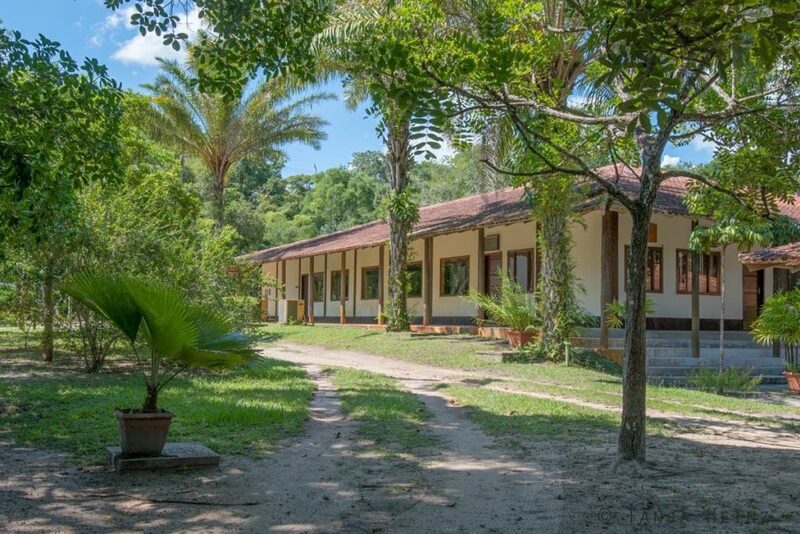 Fortunately, the owners of your pousada (guest house) in Itaúnas recommended us to visit the Reserva Natural Vale as there live a great variety of animals. Linhares is a small town with about 150.000 inhabitants and well connected to the highway BR-101, and consequently, as well to the Brazilian bus network. 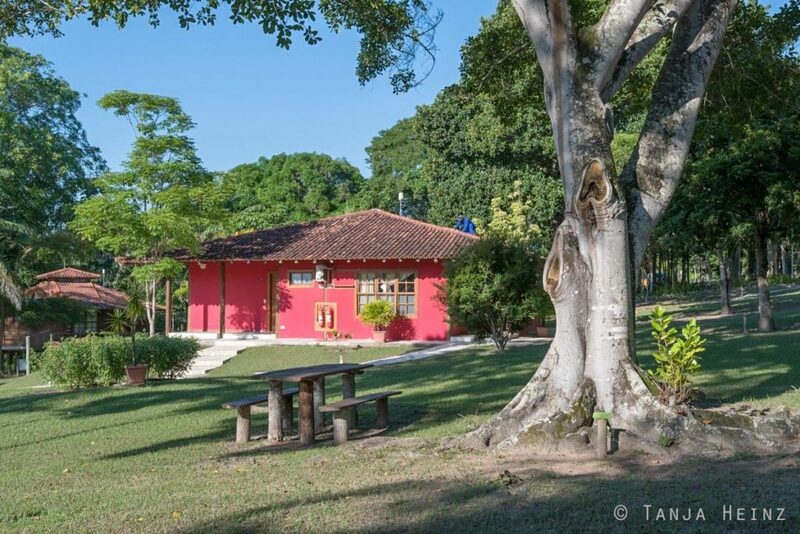 The town is located at the Rio Doce and known for its numerous surrounding lakes. The town itself is not that beautiful, because there is much traffic in the town and there are only few green places. However, the surroundings of Linhares have much to offer. As our stop in Linhares was very spontaneous and we actually had already booked an accommodation in Vitória, we had only one day and a half to explore the surroundings of Linhares. 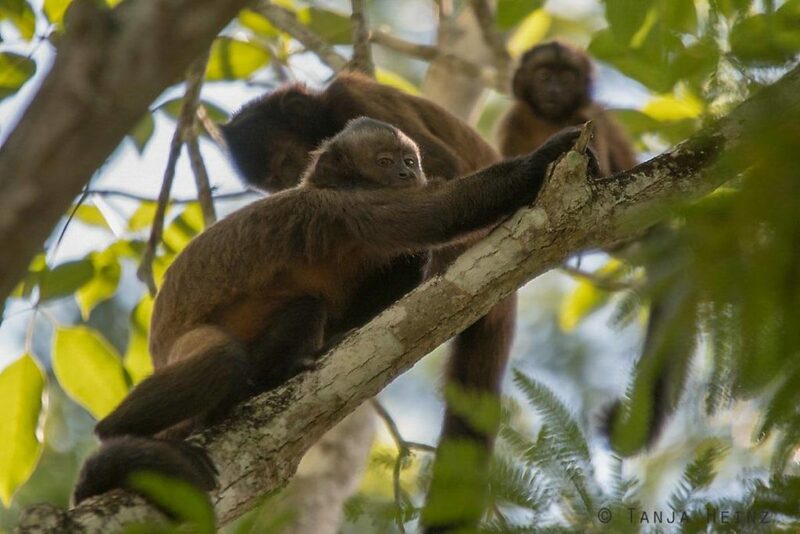 We decided to visit on one side the Reserva Biológica de Comboios where the Projeto Tamar is located and on the other side the Reserva Natural Vale. There is another place I very wished to see. And that is the Reserva Biológica de Sooretama. Unfortunately we had not enough time to visit this place. Even though Linhares is not the most beautiful place because of its traffic, it is a great starting point for further explorations of the surrounding region. Like the Reserva Natural Vale. By the way, later I should find out that the nature reserve Reserva Natural Vale is a World Heritage natural site by the UNESCO. How could I oversee this natural reserve in the travel guide! Especially this nature reserve was on our way from Itaúnas to Vitória! Nevertheless, after my “unsuccessful” wildlife encounters (actually they were not really unsuccessful, because I still saw many new and beautiful creatures) my ears were wide open for every tip and I received gratefully the tip of the owners of the pousada in Itaúnas to visit the Reserva Natural Vale. 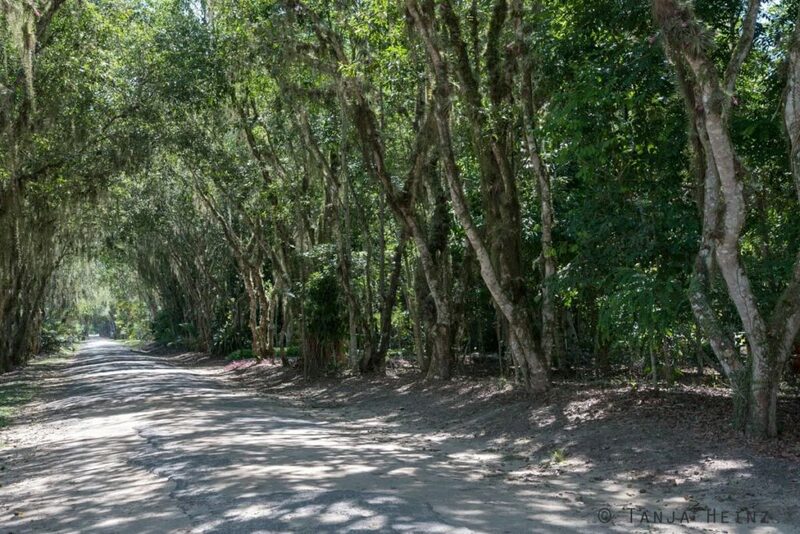 Thus, we travelled to Linhares in order to explore the Reserva Natural Vale. 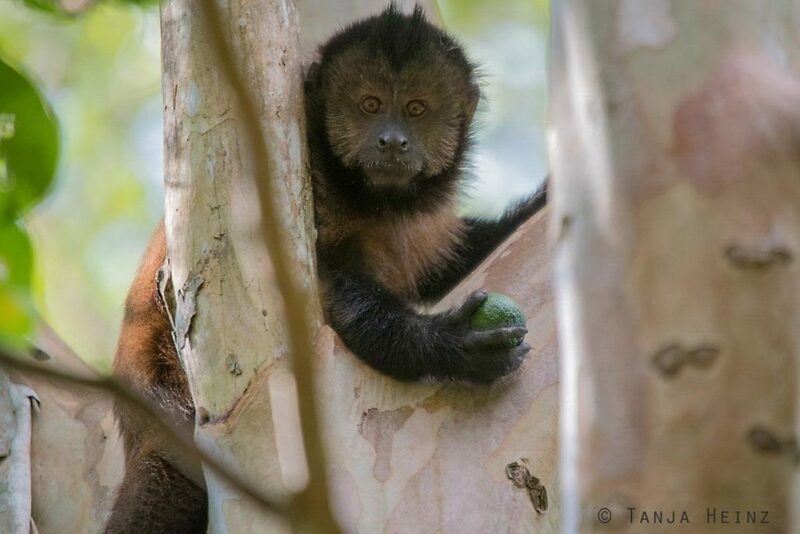 As I have just mentioned, the Reserva Natural Vale (RNV) belongs to the World Heritage natural sites of the UNESCO. Although it is a World Heritage natural site of the UNESCO, it is possible not only to exercise, but also to go for a walk or ride a bicycle in the Reserva Natural Vale . The entrance is free. 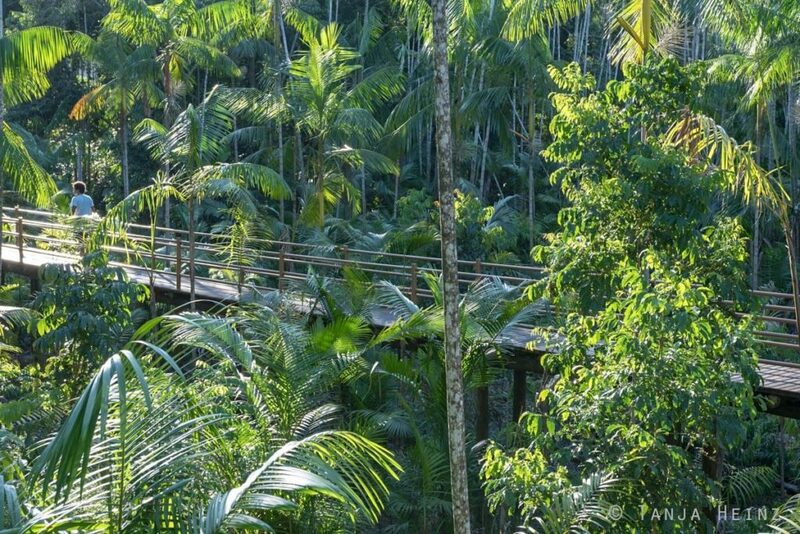 The path network has a length of about 20 kilometers and the natural reserve reaches an area of about 23 thousand hectare of Atlantic Forest (or Mata Atlântica in Portuguese). 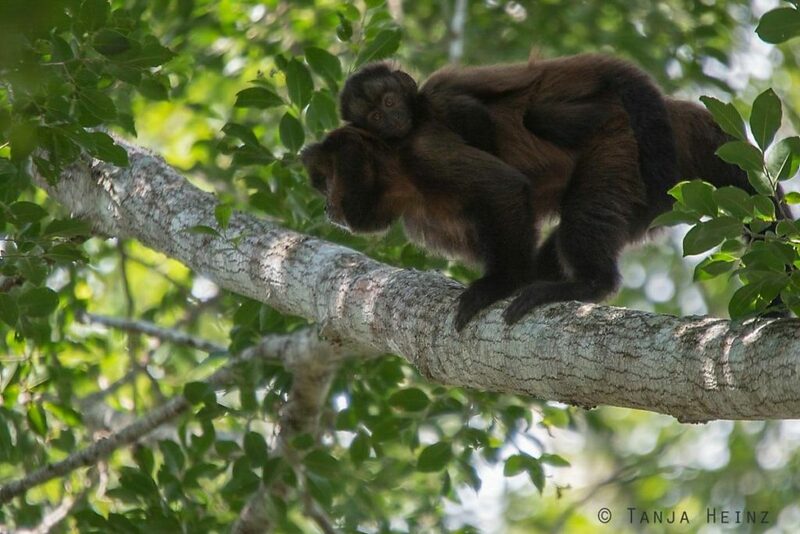 Therefore, the Reserva Natural Vale is one of the largest protected areas of Atlantic Forest. 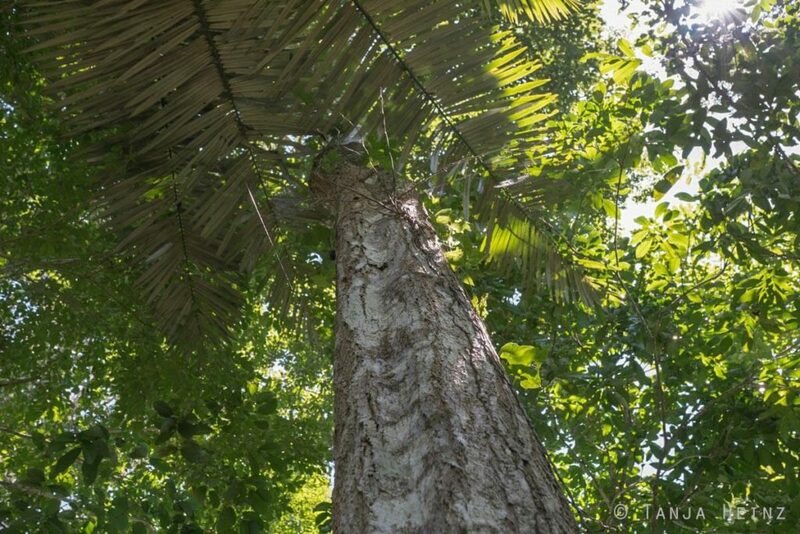 There are more than 3000 different plant species in the nature reserve. 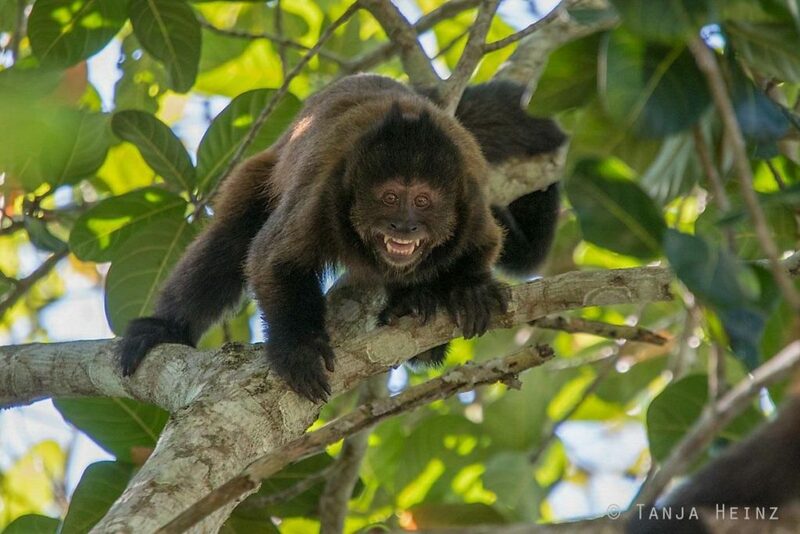 With respect to fauna, there live more than 1500 spider species, 27 different fishes, 56 species of amphibians and 64 species of reptiles in the Reserva Natural Vale. 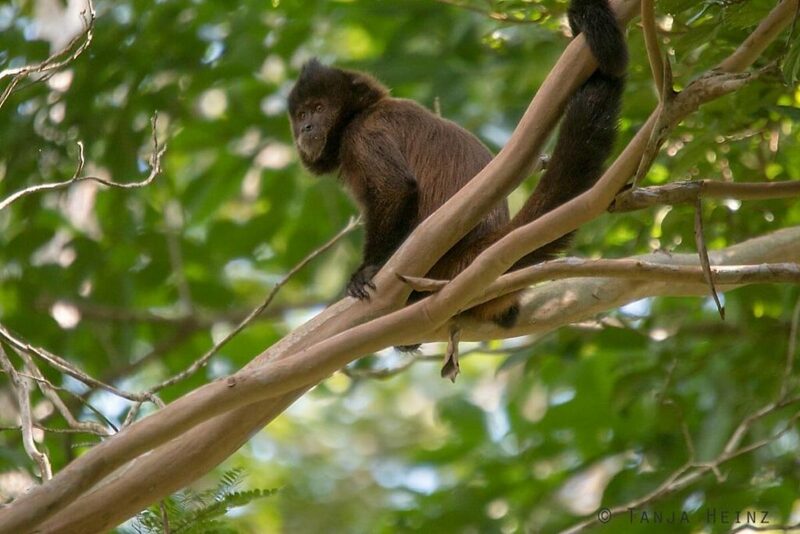 Furtheremore, the Reserva Natural Vale is home for 102 mammal and 391 bird species. A paradise for animal observers! Furthermore, the Reserva Natural Vale is perfectly organized and well-maintained. 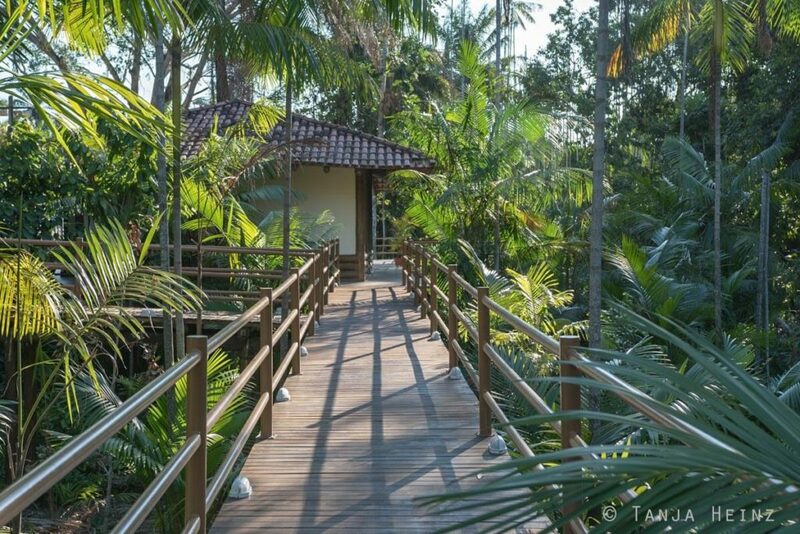 The nature reserve is operated privately and adapted to nature tourism. 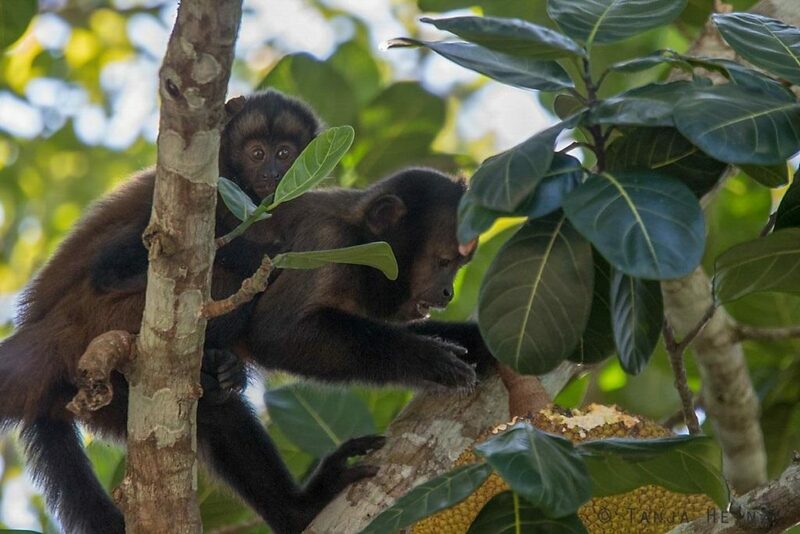 There is a permanent exhibition about the Atlantic Forest where you can learn more about flora and fauna of this biome (a community of plants and animals in a specific geographical region like here the Atlantic Forest). 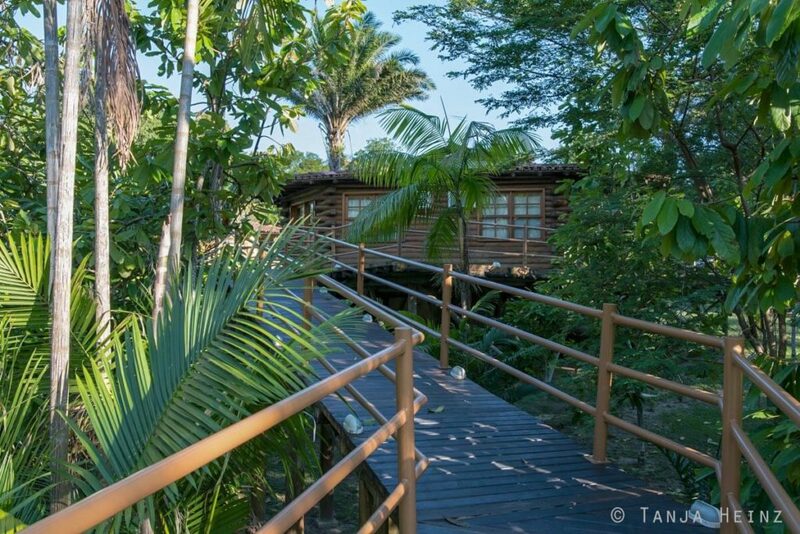 It is also possible to stay overnight in one of the lodges in the Reserva Natural Vale (more about that below). 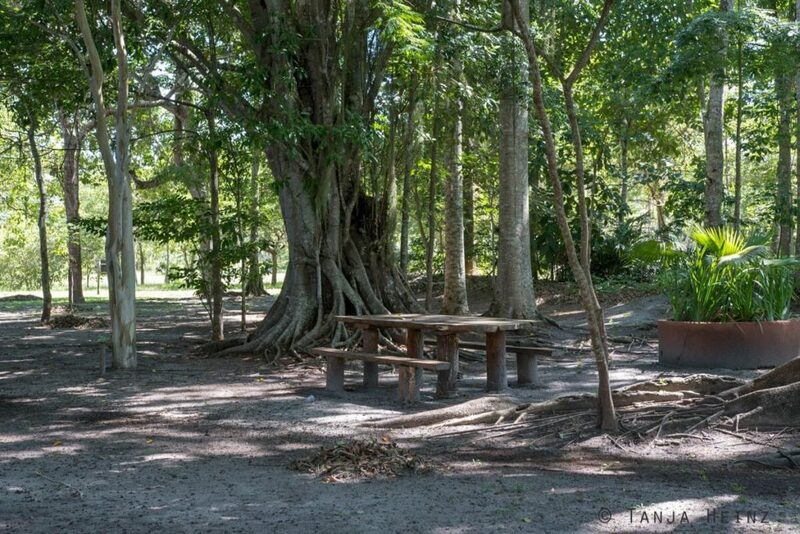 There is a restaurant in the entrance area of the nature reserve where you can find something to drink and to eat. The people of the nature reserve offer several events and activities. If you wish you can also book a guided tour through the nature reserve. For kids there is a playground at the entrance area. Maybe all this sounds more like an amusement park for you and not like a place where you can observe wild animals. However, by all means the Reserva Natural Vale is not an amusement park. 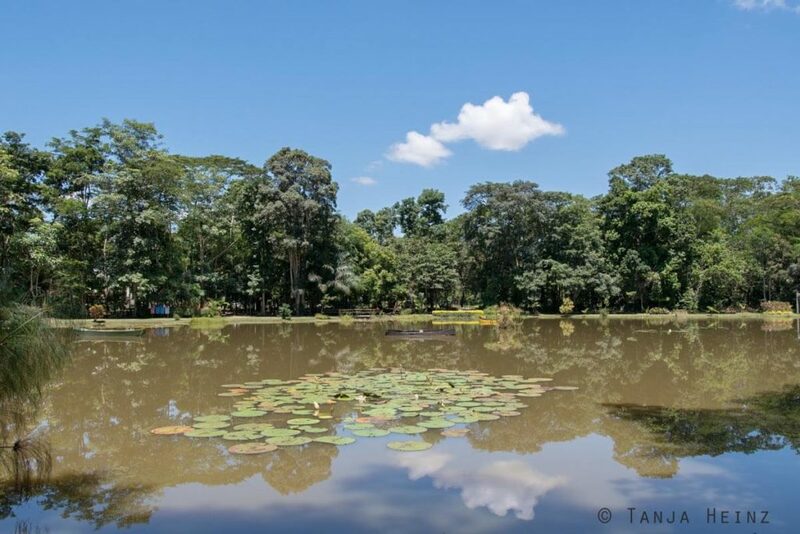 The nature reserve just has an outstanding infrastructure and is relatively easy accessible where you even find a possibility to stay overnight close to the forests. 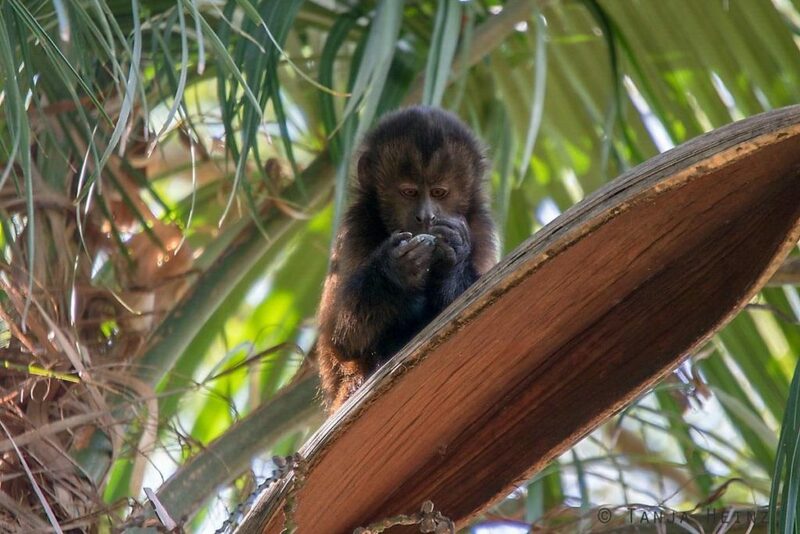 There is no animal show in the nature reserve and the animals do not receive any food. 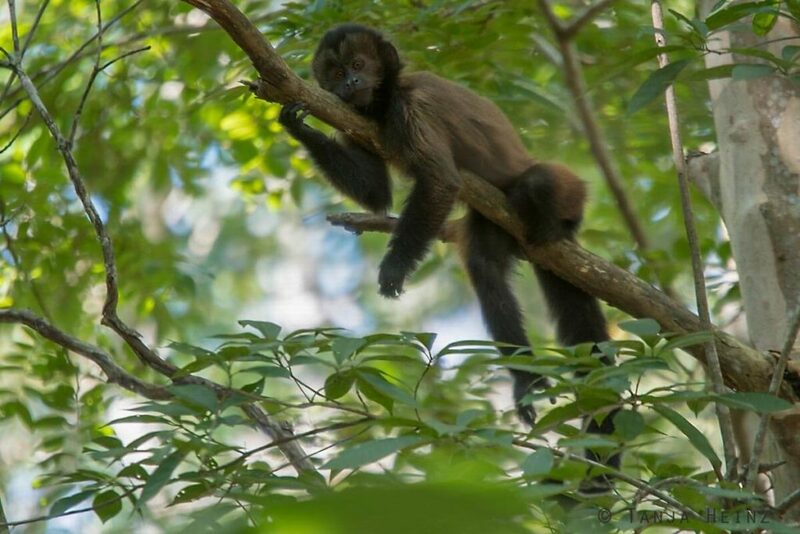 If you want to see wild animals in the Reserva Natural Vale you either have to walk through the Atlantic Forest on your own or you can join one of the guided tours. We took one of the maps provided in the office of the Reserva Natural Vale and started our own tour through the Atlantic Forest. However, at first we stopped at the small lake close to the office of the nature reserve. In the office they told us that there is sometimes a tapir close to the lake. Unfortunately we were not lucky, and thus, did not see the tapir. However, I just thought: “I’m sure. 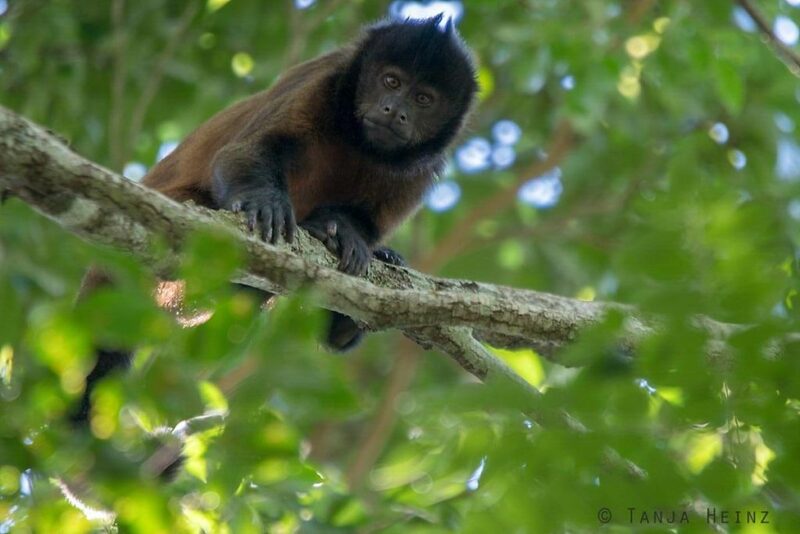 I will see other animals in the Reserva Natural Vale”. Before we started we asked the people in the office of the nature reserve where we should search for the animals. They could tell us that a tapir shows up quite often at the lake, but with respect to other animals they could not really tell us where to search. We just have to search and be lucky. All animals are wild, and thus, free with their decisions. 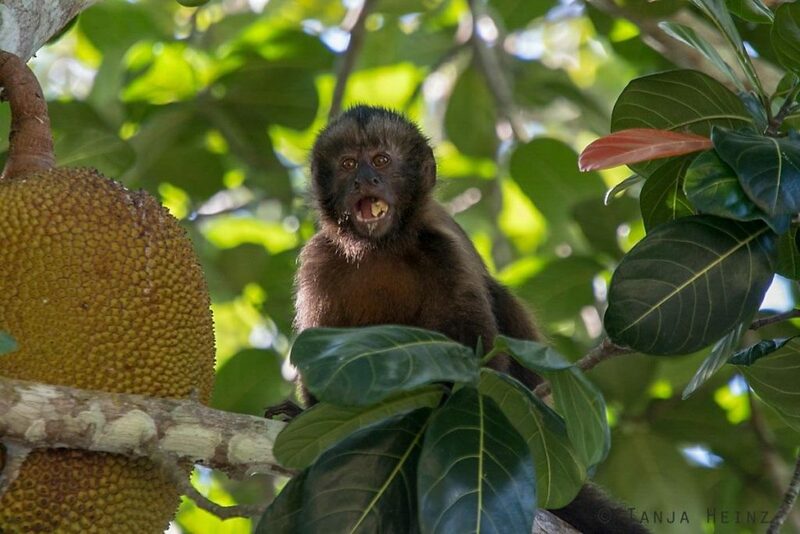 Thus, we headed to the Atlantic Forest in the Reserva Natural Vale and tried our luck on our explorations. 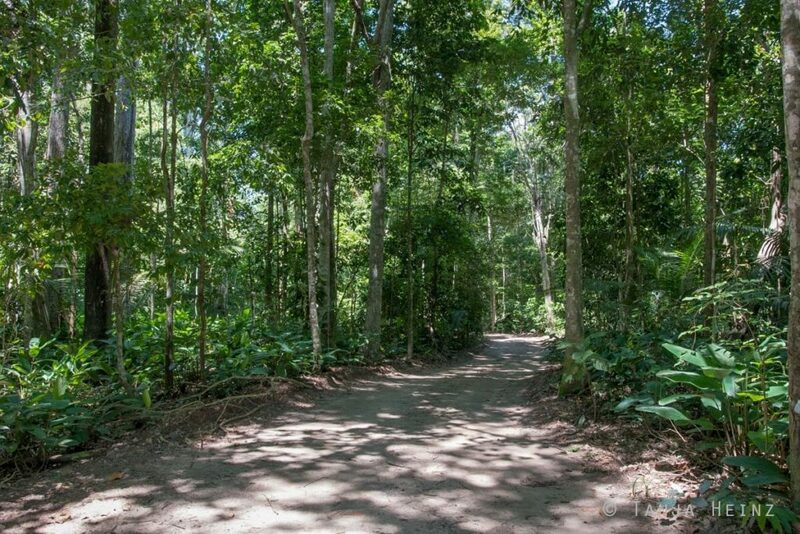 … but also narrow paths leading through the Reserva Natural Vale. 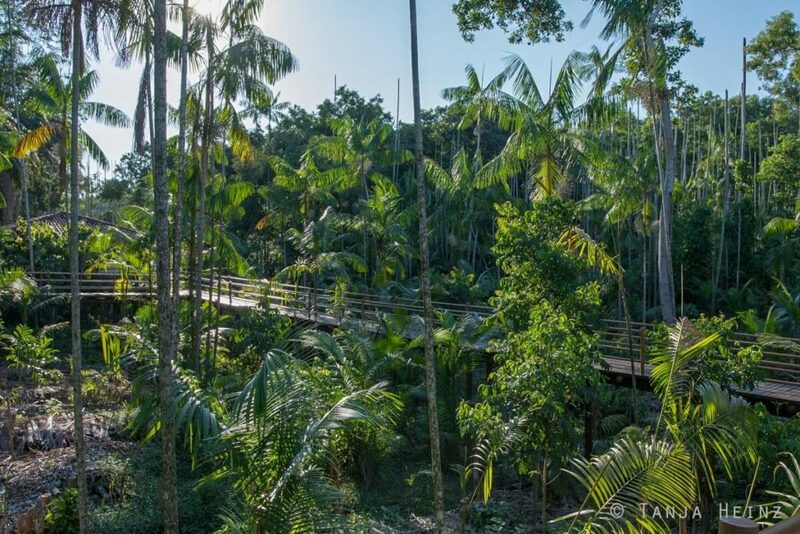 As the Reserva Natural Vale is so well organized, we found much information about the trees of the Atlantic Forest on our path. I was especially happy to encounter an „ipê-rosa“. I knew this tree from numerous photographs. The tree is especially beautiful during the blooming period, because during the blooming period the tree converts into a sea of pink flowers. As you can see on the photo I was not in the Reserva Natural Vale during the blooming period, because the blooming period starts only at the end of June. We visited the Reserva Natural Vale in March. Still I was happy to have encountered this tree during my time in Brazil in the Atlantic Forest. Furtheremore, apart from the mosquitos we did not see any other animal. Only once we saw something moving in the shrubs. However, we could not really see which animal it was. Maybe it was a cabybara? After our unsuccessful search under the midday heat and the annoying mosquitos we left the forest area and stayed closer to the office of the nature reserve. 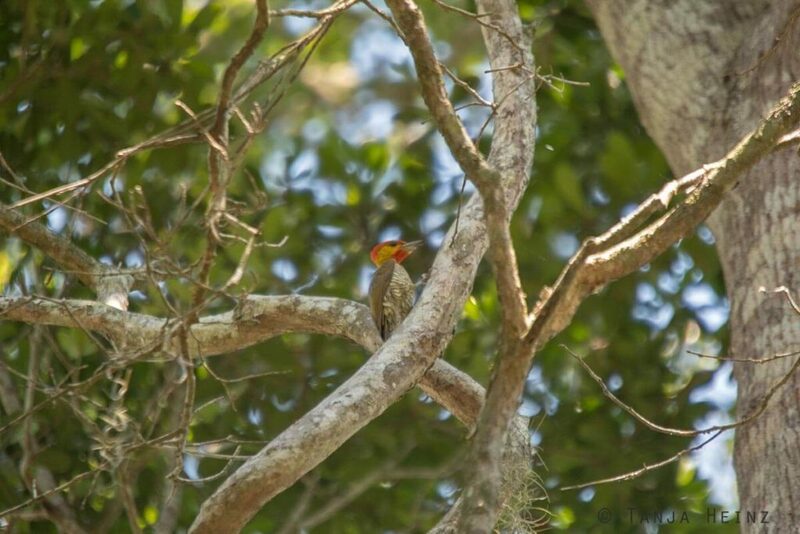 While we rested in the shadow of some trees we spotted at one of the trees a yellow-throated woodpecker (Piculus flavigula). So far we had encountered many birds on our walks. However, on this day we spotted comparatively few birds. Of course there are many different birds in the Reserva Natural Vale (that means 391 different species! ), however, we were just too late on this day. We arrived in the Reserva Natural Vale only around midday. And around midday it is more difficult to observe birds. We were late on that day, because we had to rent a car in the morning. We could not manage to rent a car in the evening before as we arrived in Linhares too late. 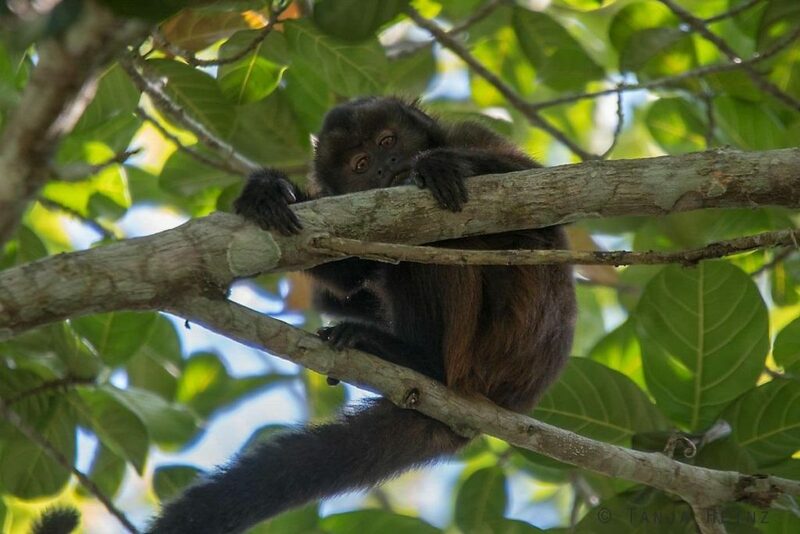 Nevertheless, we should meet some more animals in the Reserva Natural Vale. 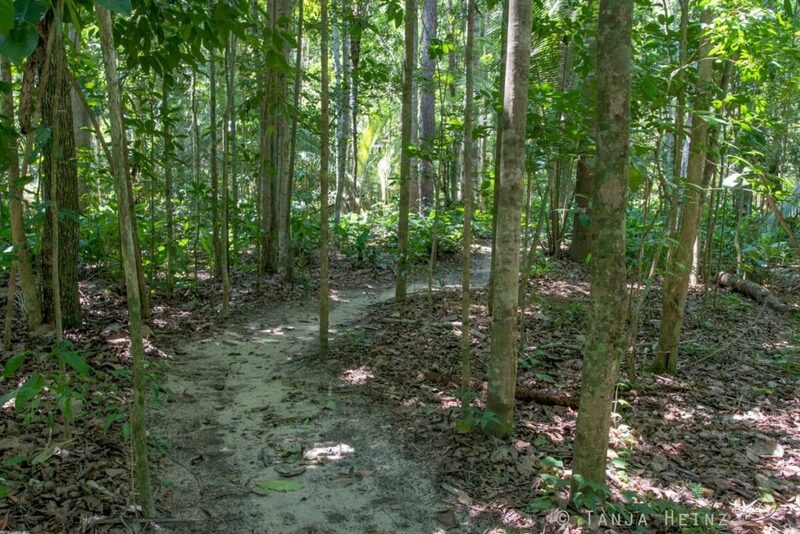 After our short rest we walked into the direction of another forest area to avoid the mosquitos. However, this did not really work out! When we arrived at a timber roof on stilts we took a small rest again in the shadow to find protection from the hot midday sun. But one moment later we heard something moving in the trees. 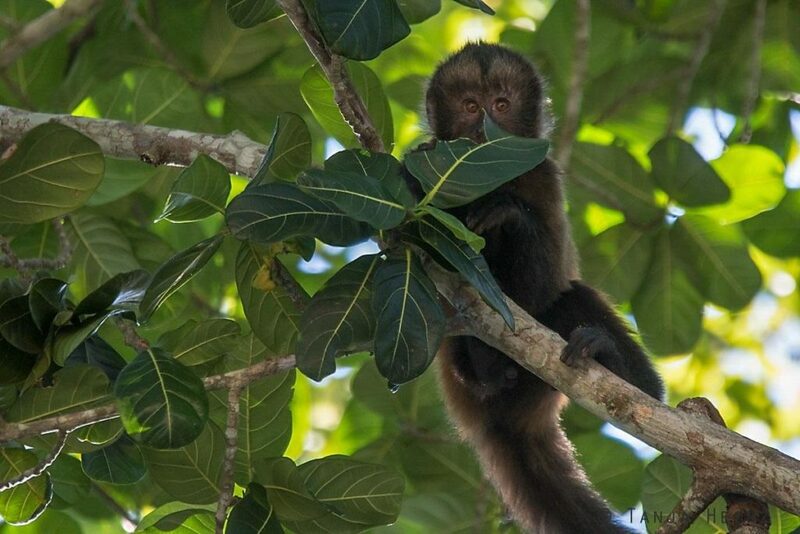 If you know my article about the Northern muriquis in the Feliciano Miguel Abdala Natural Reserve, then you also know that the first capuchins I have met in Brazil were not the crested capuchins. 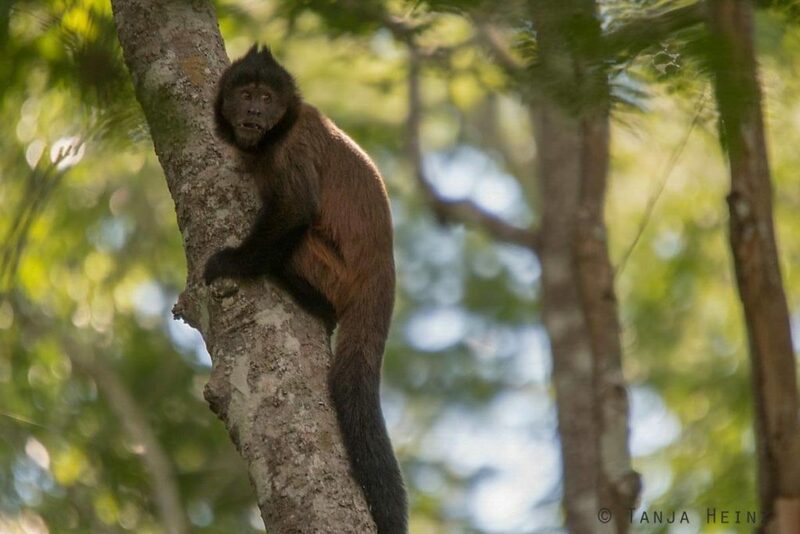 That is to say, in the Feliciano Miguel Abdala Natural Reserve I did not meet the crested capuchins, but the black capuchins (Sapajus nigritus). 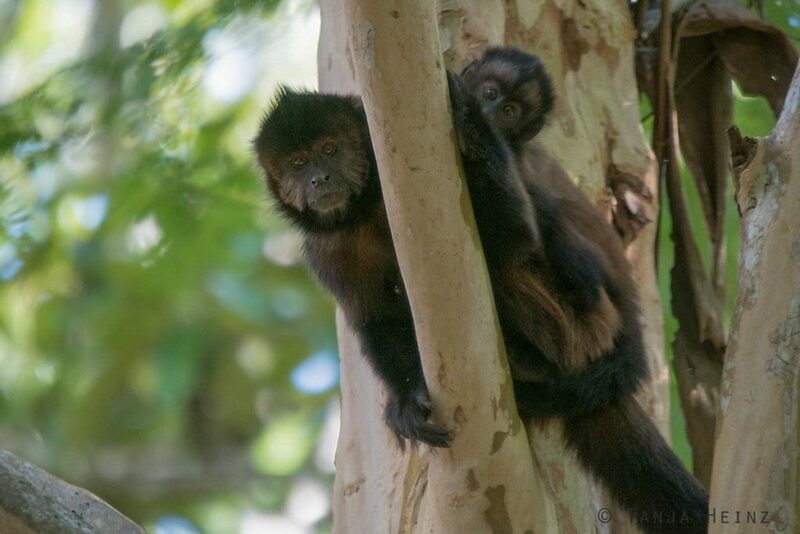 Both belong to the robust capuchin monkeys (Sapajus). 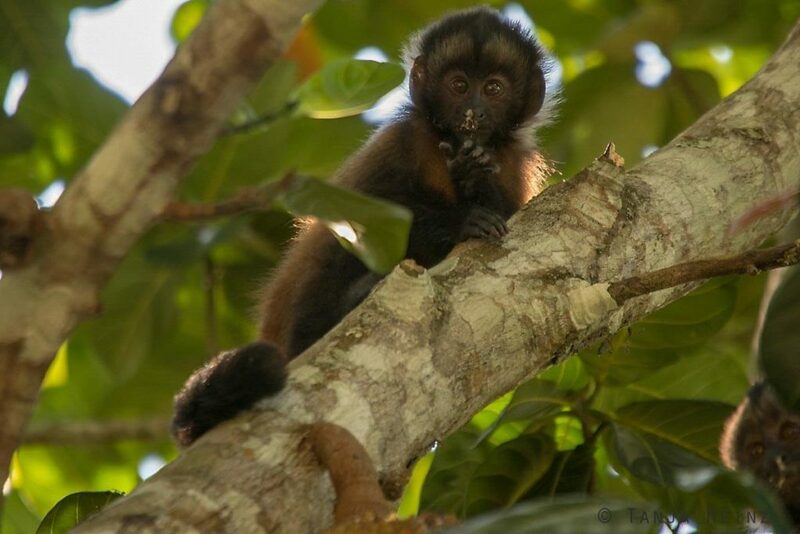 The other group of capuchin monkeys are named gracile capuchin monkey (Cebus). I did not see any monkey species of the Cebus genus. 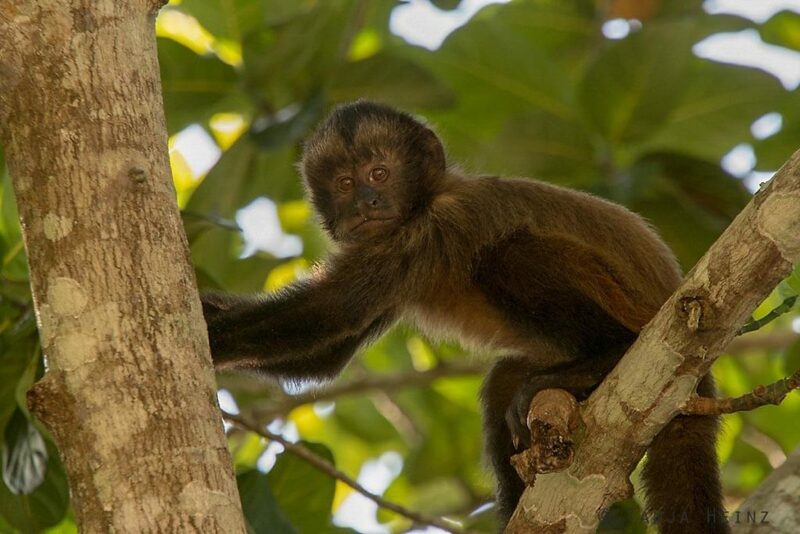 Capuchin monkeys are New World monkeys. That means, they occur naturally only in the New World, that is, in America. 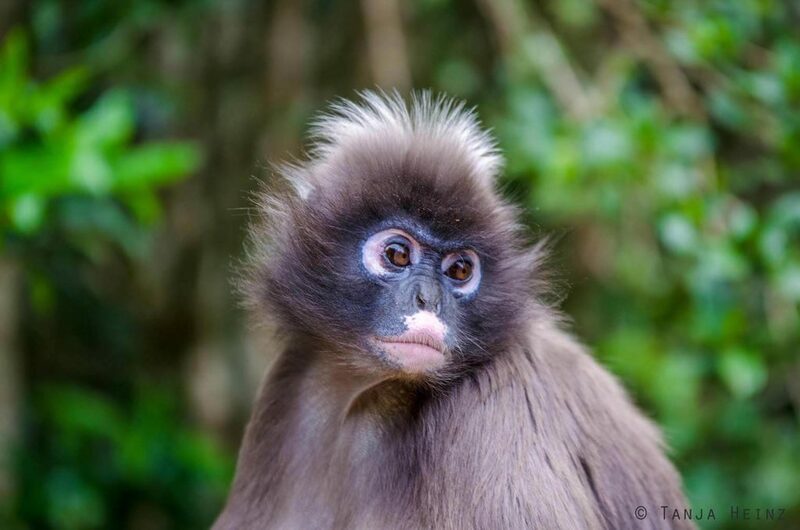 On the contrary, Old World monkeys live only in Eurasia and Africa. 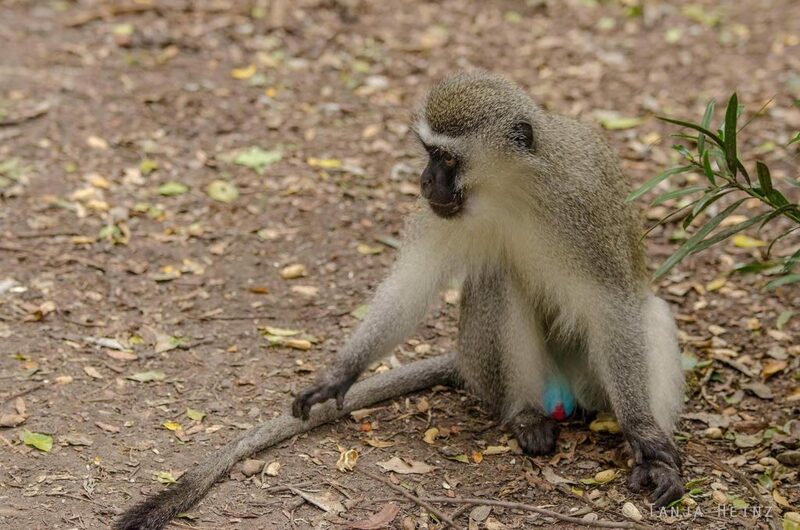 For example, vervet monkeys (Chlorocebus pygerythrus) or Spectacled langurs (Trachypithecus obscurus) are Old World monkeys. Maybe you remember my article about Monkeyland in South Africa. 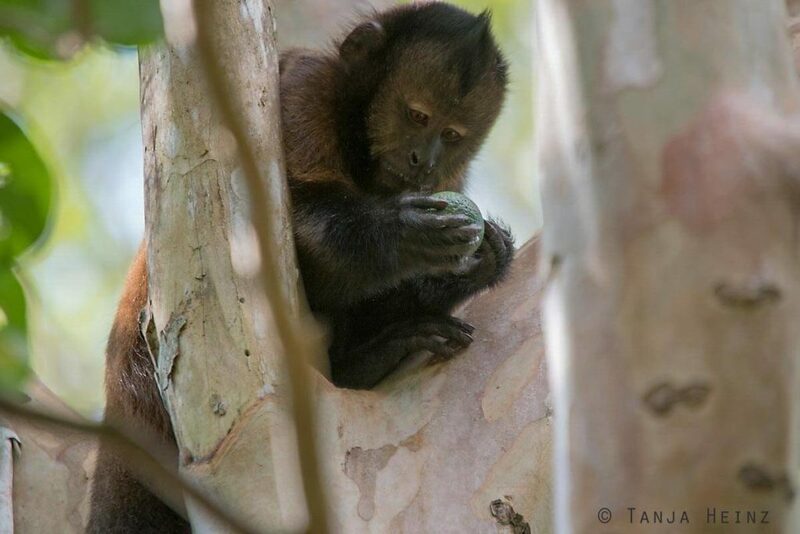 In Monkeyland I had already met capuchin monkeys in a protected forest. 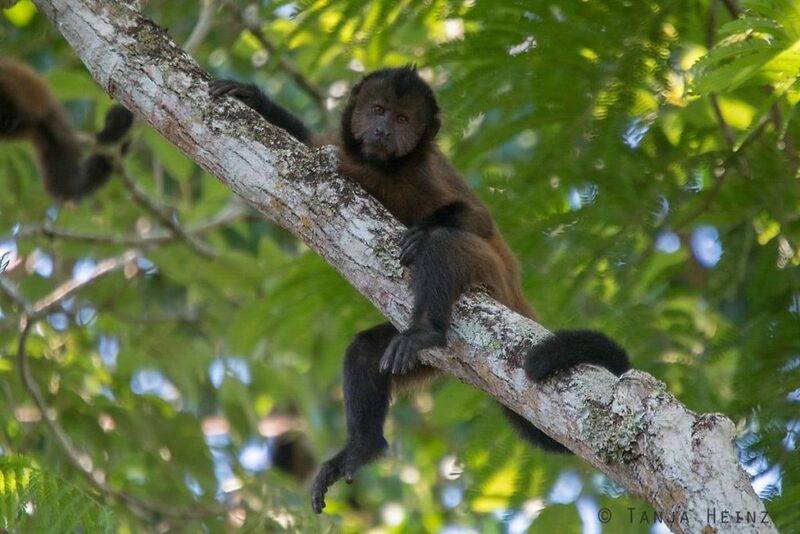 And that is the tufted capuchin (Sapajus apella). 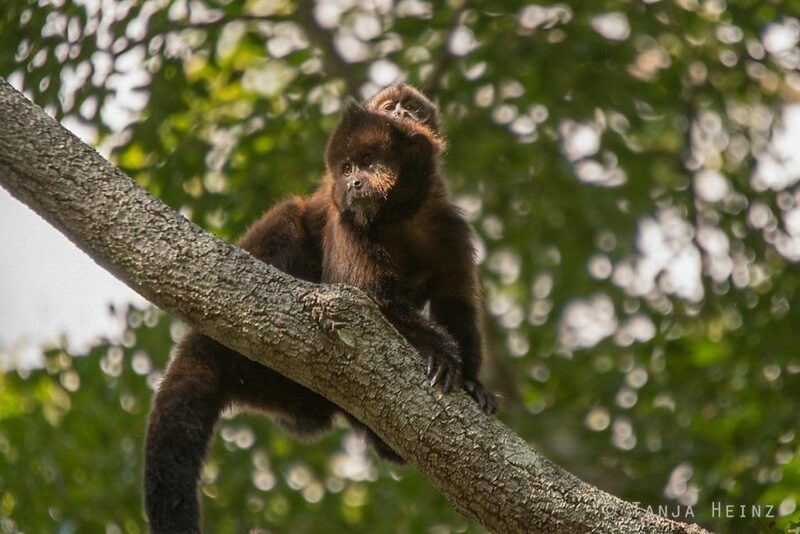 For me it was a little bit strange to see so many different monkey species from different continents in one forest area. 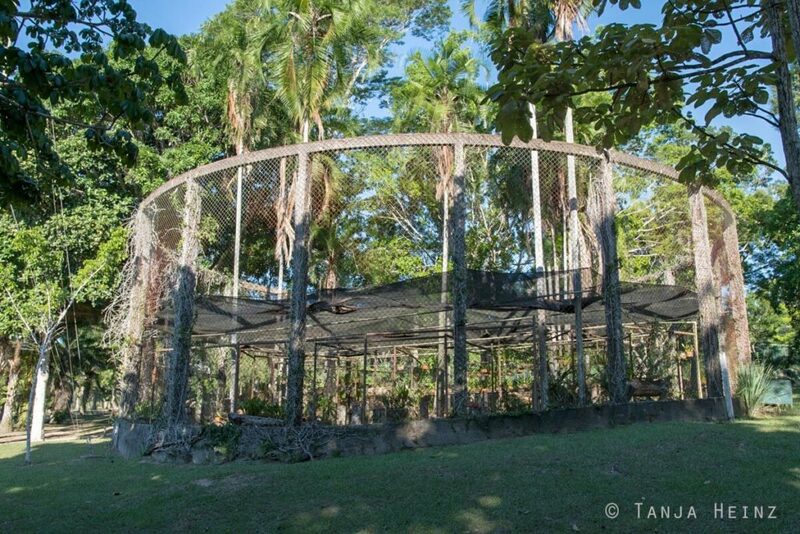 However, I have to mention here that Monkeyland is a protected area for monkeys. 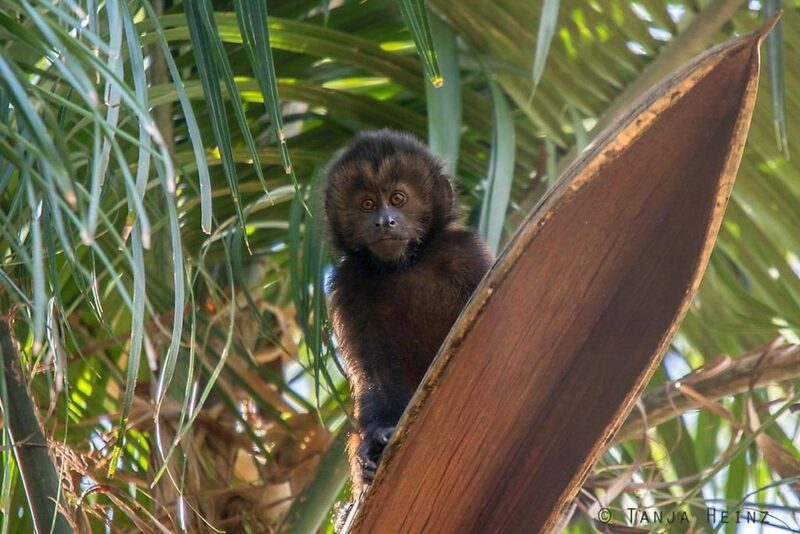 That means, Monkeyland provides a new and protected home for monkeys that cannot return into the wild as they had lived before as pets or in circuses. In Monkeyland they get in part their freedom back, because in Monkeyland they can move as they want. 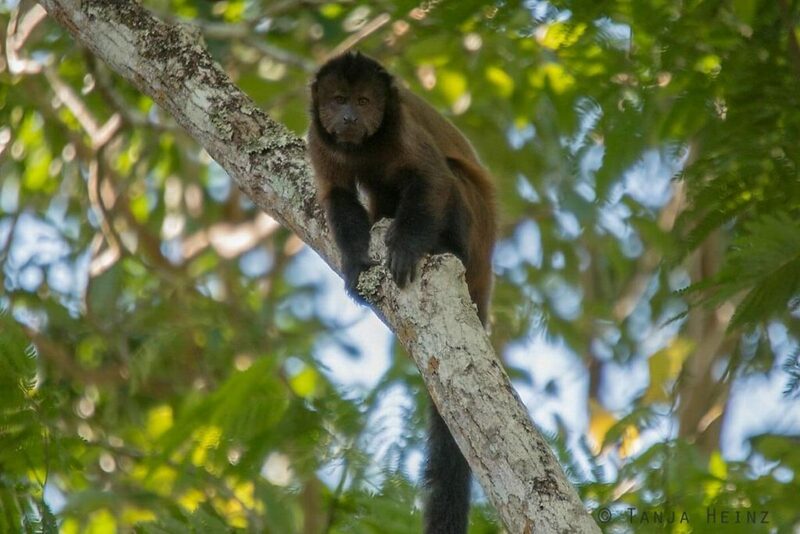 However, the crested capuchins in the Reserva Natural Vale are one hundred percent free. Of course, because of this it is more difficult to search for the animals. 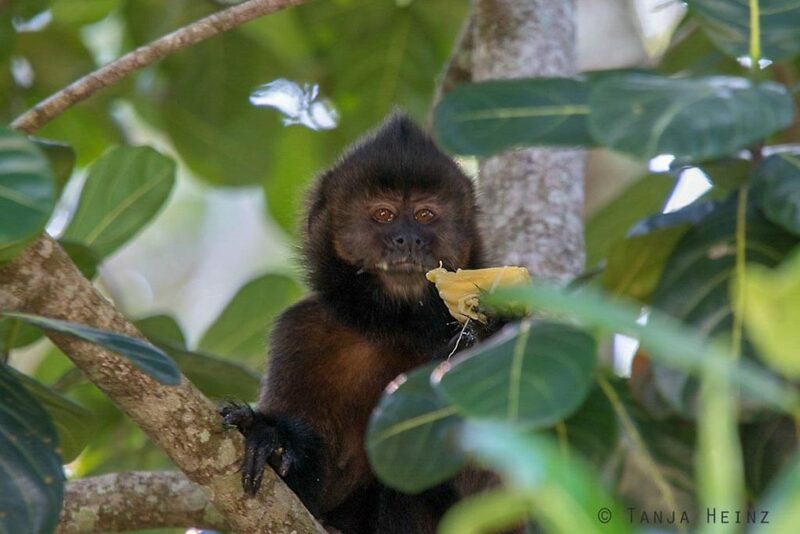 Therefore, we were very happy when a group of crested capuchin monkeys crossed our way. I could not count the number of animals as they were so widely distributed. However, I estimated the number of animals between 15 and 20. That meant for me: There is much to observe! 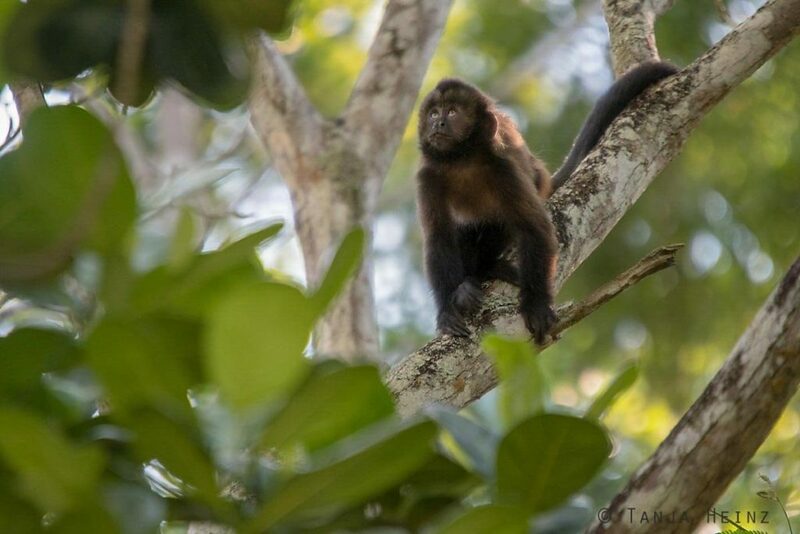 At the beginning I had some difficulties to photograph the animals, because I had not the best light conditions in the forest and because the crested capuchins move around high up in the trees. 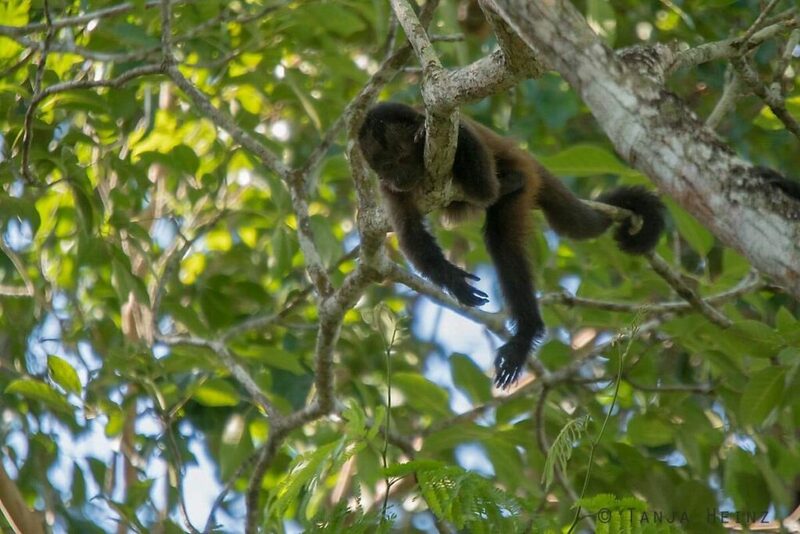 I was grateful when some of the capuchin monkeys took a rest. 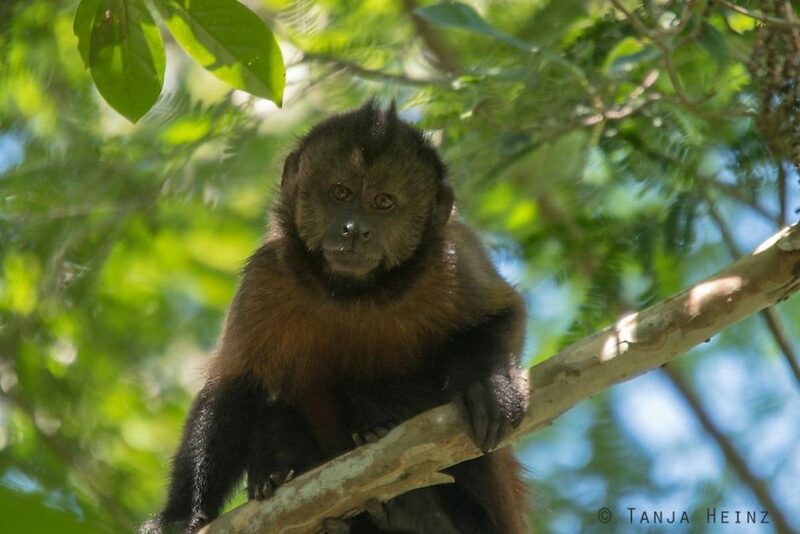 When I look at the head of this capuchin monkey, I understand why they are name crested capuchins. 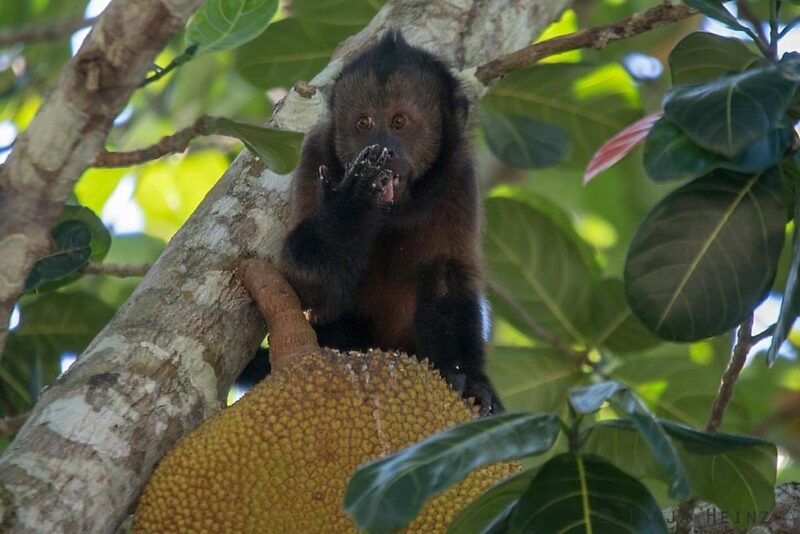 One of the first crested capuchins I could observe a little bit closer was one of the smaller ones. … and watched it intensely in its hands. It seemed to me as if it would ask: „How can I open this fruit?“. 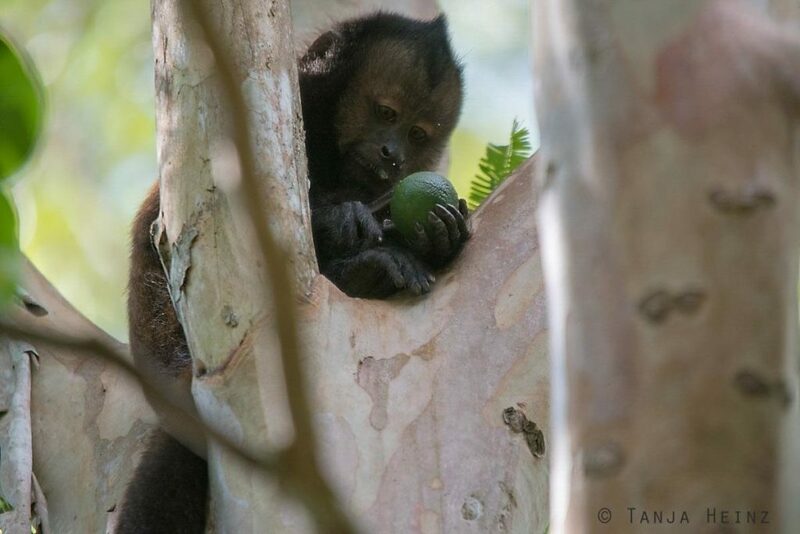 However, this crested capuchin was not the only one I observed with a fruit in its hand. Another individual as well found a fruit in the forest. 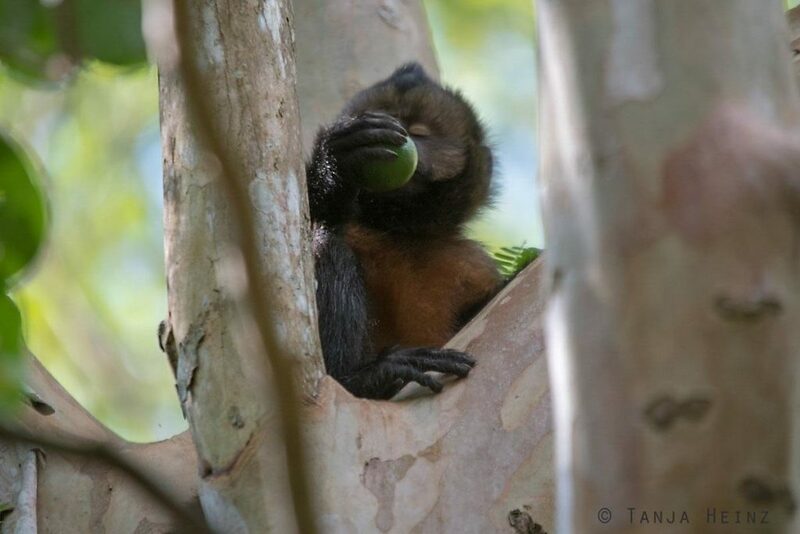 Likewise, this monkey seemed to ask itself the same question how to open the fruit. … and sometimes it tried it a little bit harder. I saw some fruit juice splashing into its face. However, I could not observe how much this individual got from the fruit. At least it got a little bit from the fruit. There was so much to observe. It was difficult to focus on only one animal. I wanted to see just everything of them. 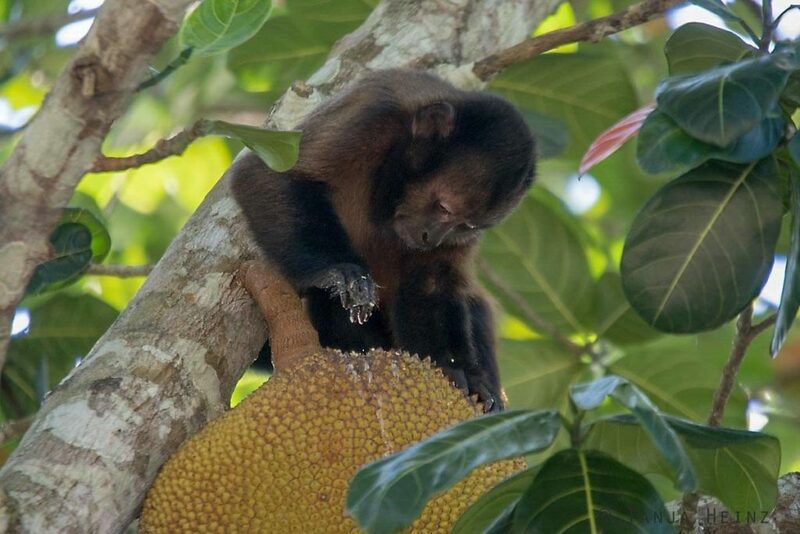 However, as this other crested capuchin with the fruit moved up the tree it was more difficult to observe it. Furthermore, just in the same moment I observed a mother with her young. … then she moved again. But it appeared to me that she felt safer high up in the trees. Was it because of our presence? At one point she stopped and looked directly into our direction. However, as she moved again away from us, I did not follow her anymore. I thought that this mother might be more cautious because of her young. Especially with respect to humans! Thus, I tried to search for another animal that did not look stressed by our presence. There was one group lying comfortably on some branches. They also became aware of me and my camera. At first one of them looked kind of upset into my camera. 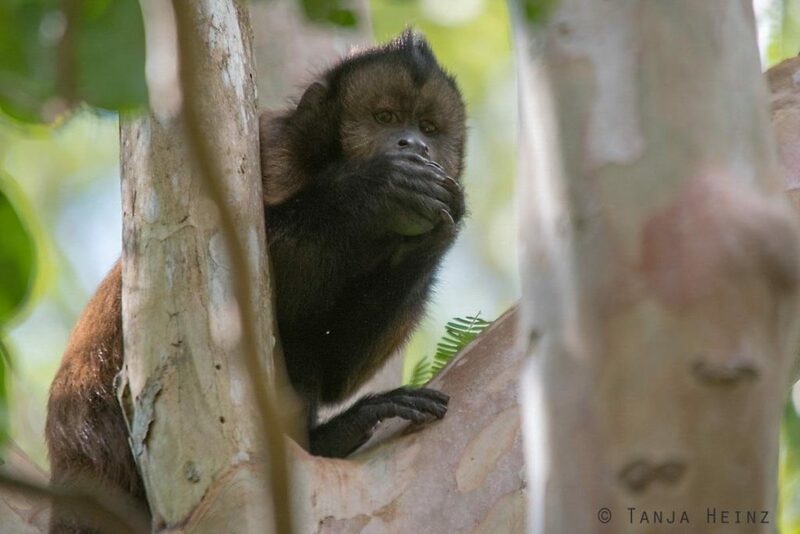 However, just a few seconds later this crested capuchin relaxed again. 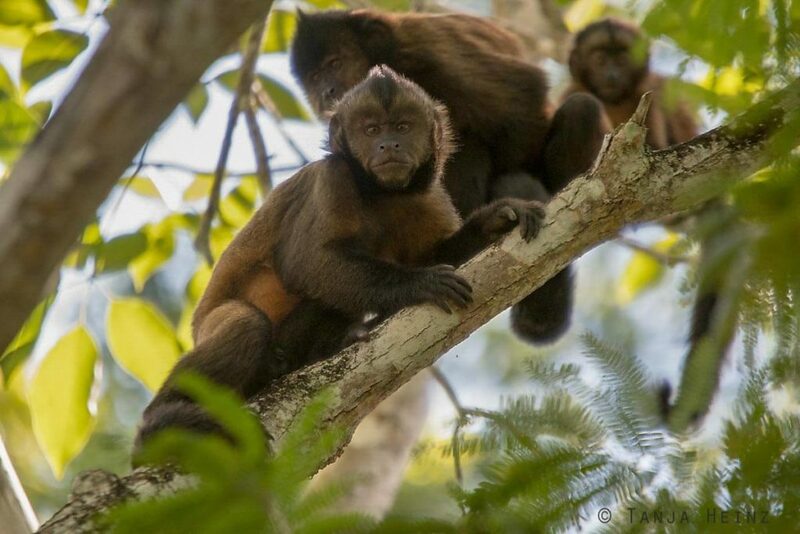 On my route through this forest area I spotted some more crested capuchins. 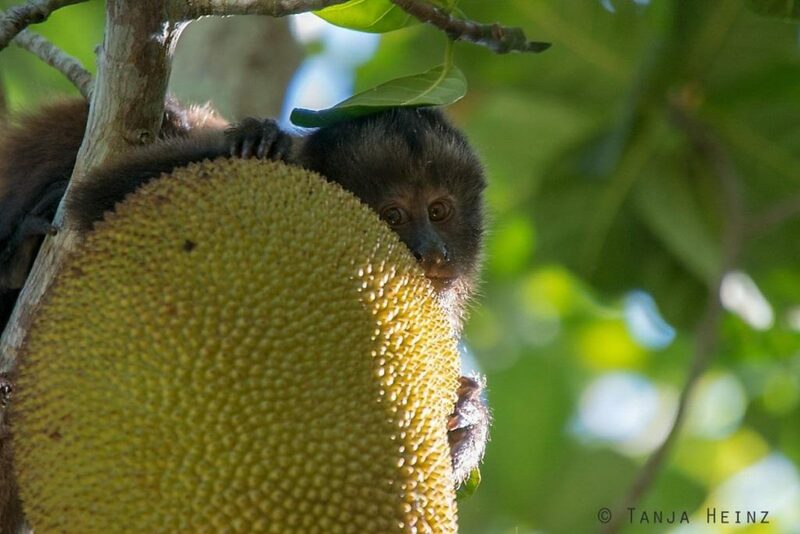 … another one was sitting comfortably on a tree trunk. Some of them noticed my presence. 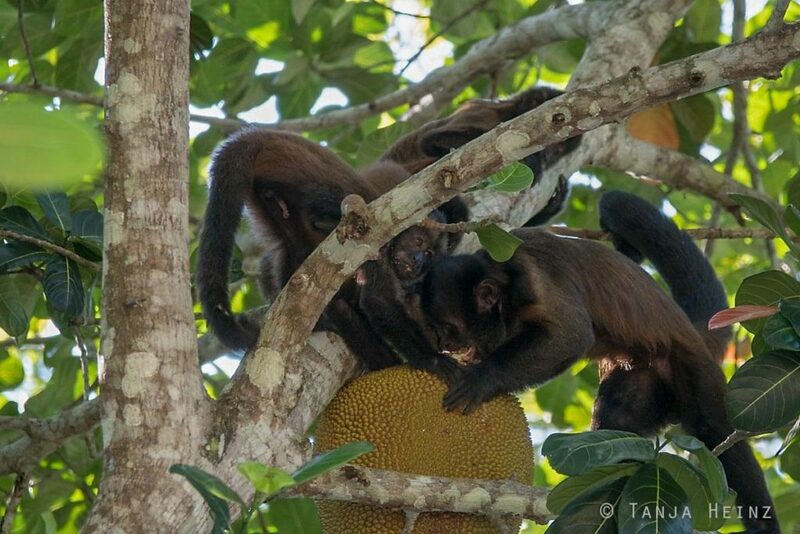 It became even more exciting when some of the younger crested capuchins were moving to a jackfruit tree. 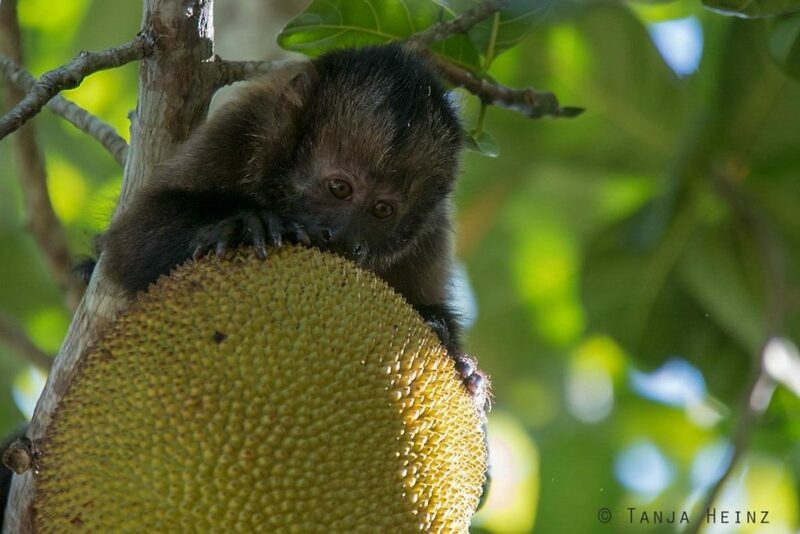 … another individual of the crested capuchins achieved to open a jackfruit. … to get as much as possible from the fruit flesh. … but they also took turns. The other animals seemed to wait patiently until it was their turn (again). The atmosphere was quite peaceful. 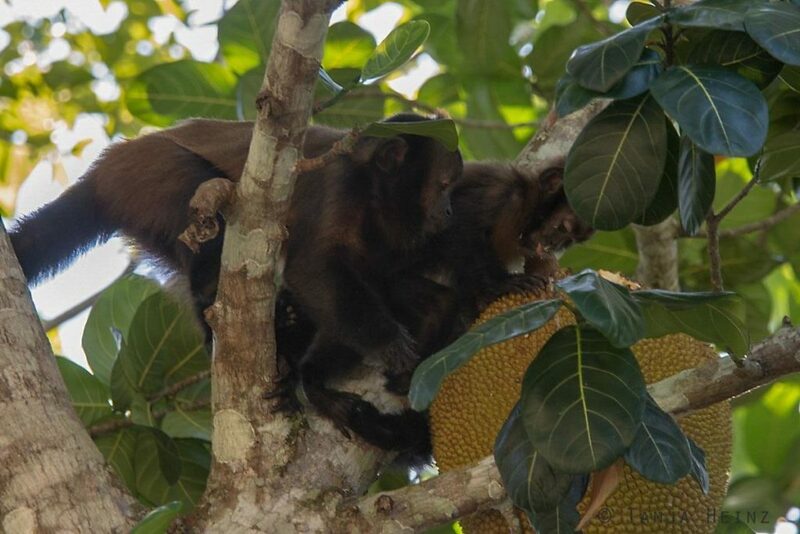 However, when another crested capuchin arrived at the jackfruit the atmosphere changed (maybe it was the alpha male?). 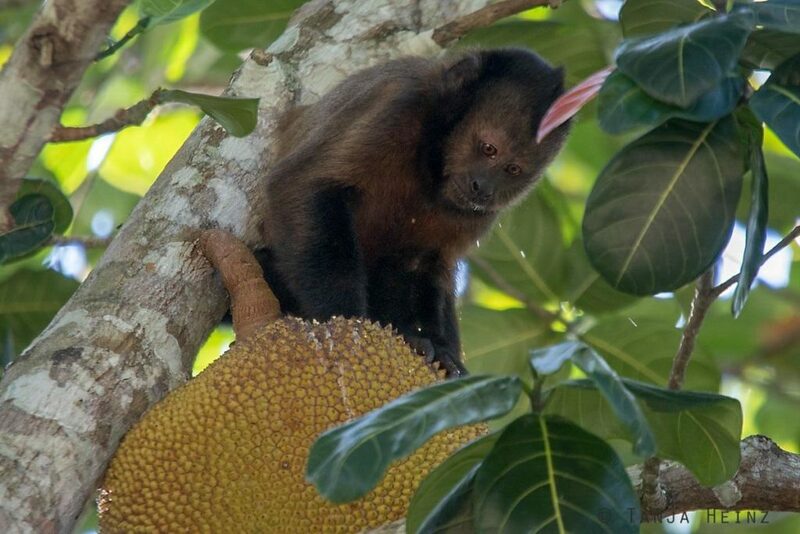 When this male reached the jackfruit tree, the other crested capuchins ran away. Nevertheless, this individual did not appear to be hungry as soon after its arrival it relaxed high up in the trees again. 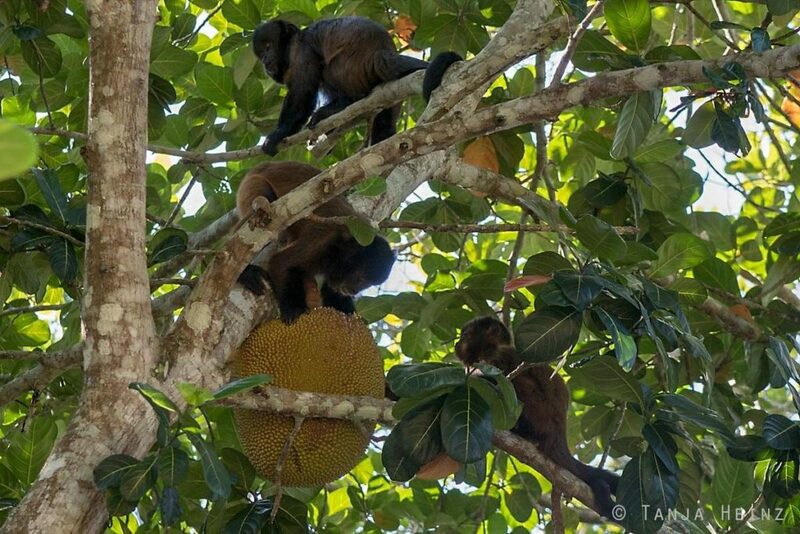 The other crested capuchins started to gather around the jackfruit once more. I thought, maybe this individual just wanted to make way for the mother with her young? Of course, I cannot tell if this really was the reason for its behavior as I just got to know this group on that day. It also might have been a male reassuring its dominance. 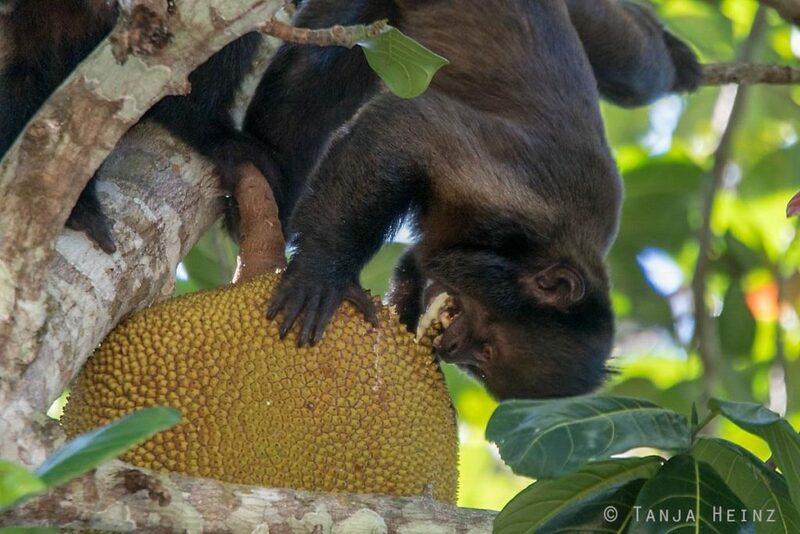 … and withdrew on a branch in a tree to enjoy a piece of jackfruit. … still seemed to be hungry as apparently it was reaching out its hand. 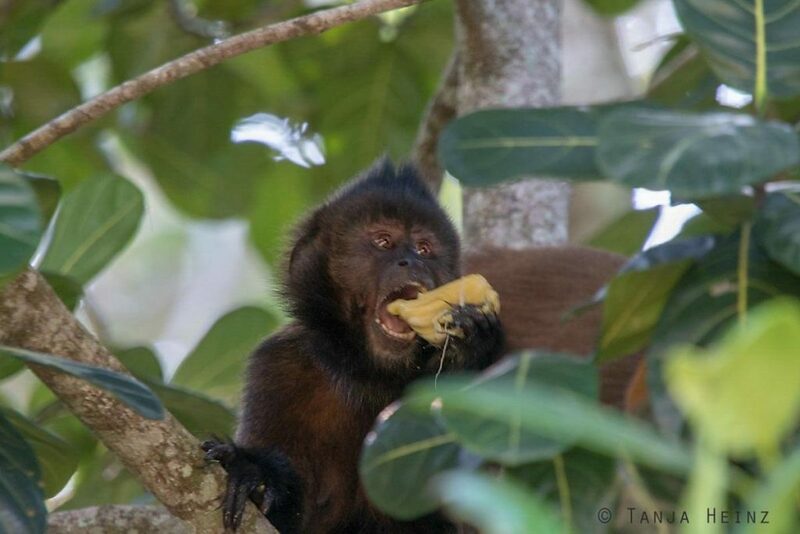 Just before we left we observed some of the smaller crested capuchins gnawing on leaves. 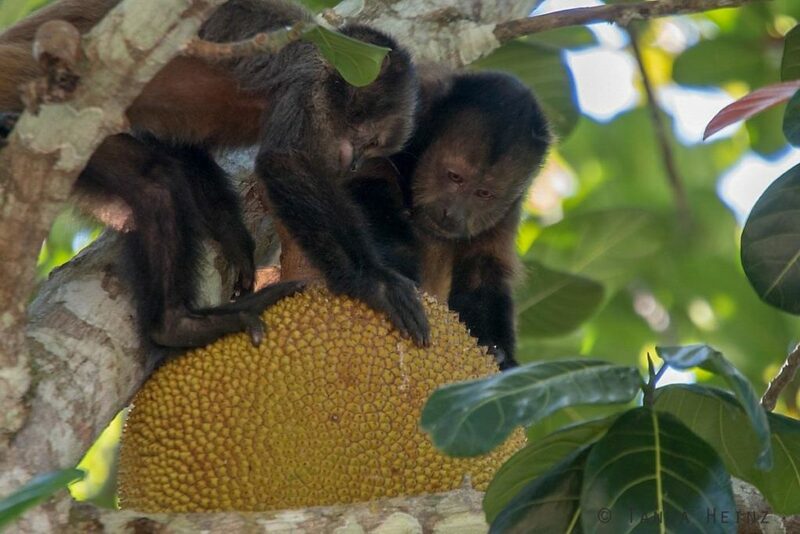 Here I want to emphasize that the crested capuchins are endangered according to the IUCN and that the distribution of this species is restricted to a very small region in Brazil. 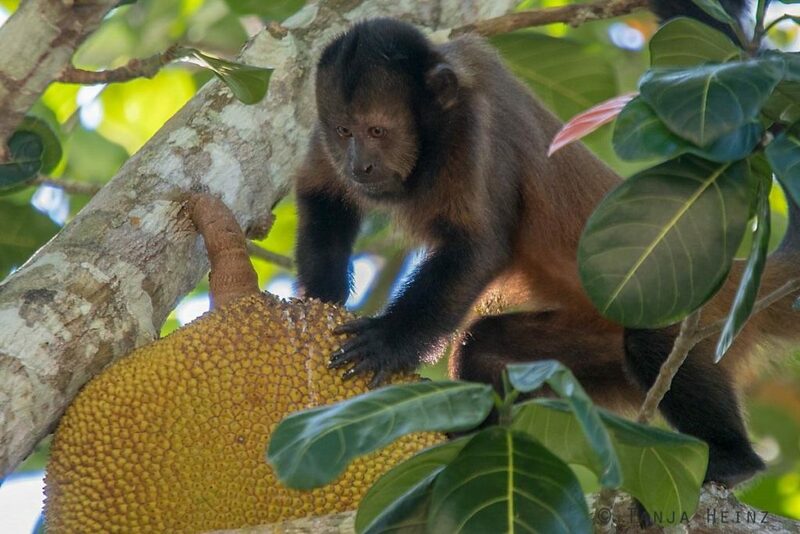 That is to say, crested capuchins live only from the South of Bahía and the Northern parts of Minas Gerais to the Rio Doce in Espírito Santo. 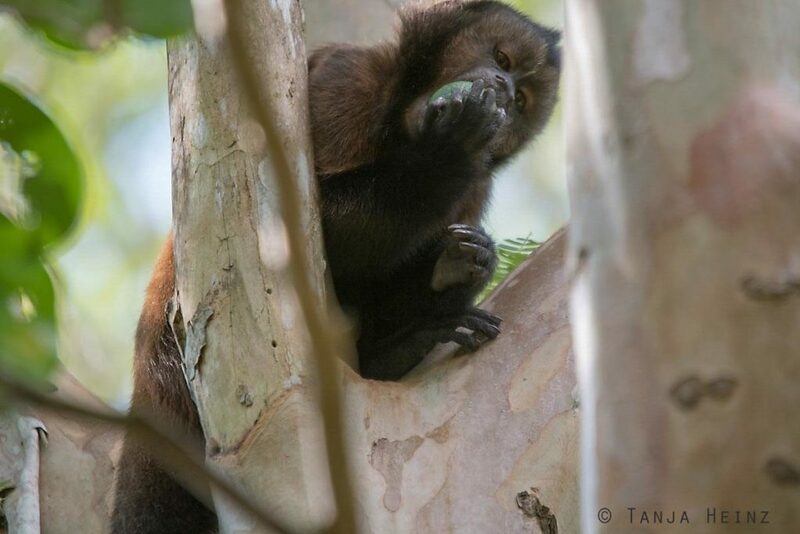 I felt so privileged to observe crested capuchins on their search for food in the Reserva Natural Vale. 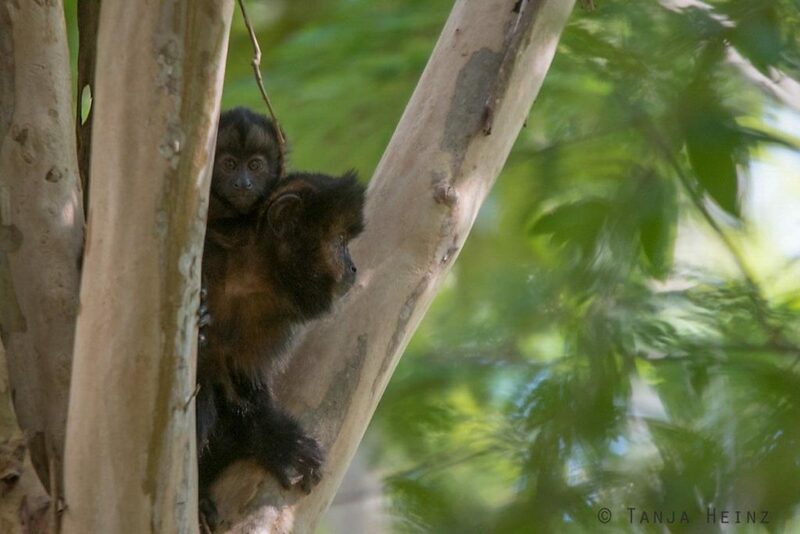 When I was in the Reserva Natural Vale I did not know that the crested capuchins are endangered. 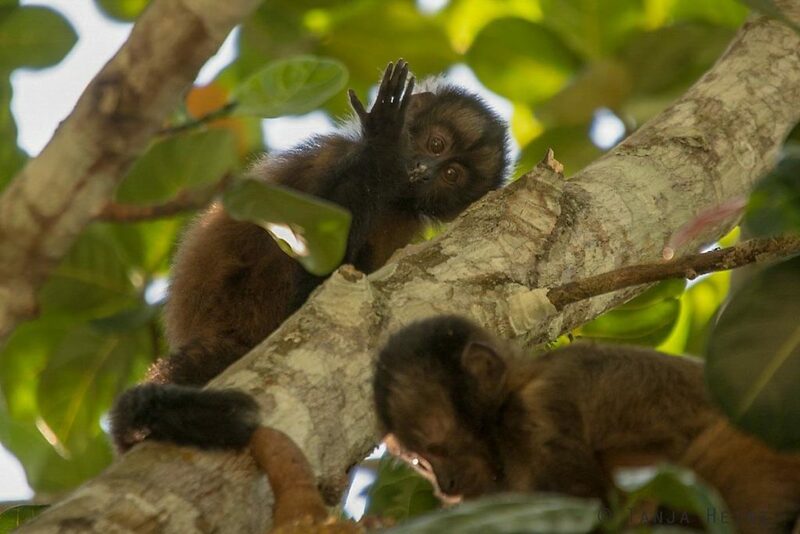 Therefore, I very appreciate my encounter with the crested capuchins! As I mentioned above we could not stay overnight in the Reserva Natural Vale on those days when we visited the natural reserve. We would have loved to do so! On those days they conducted a general cleaning of the houses. 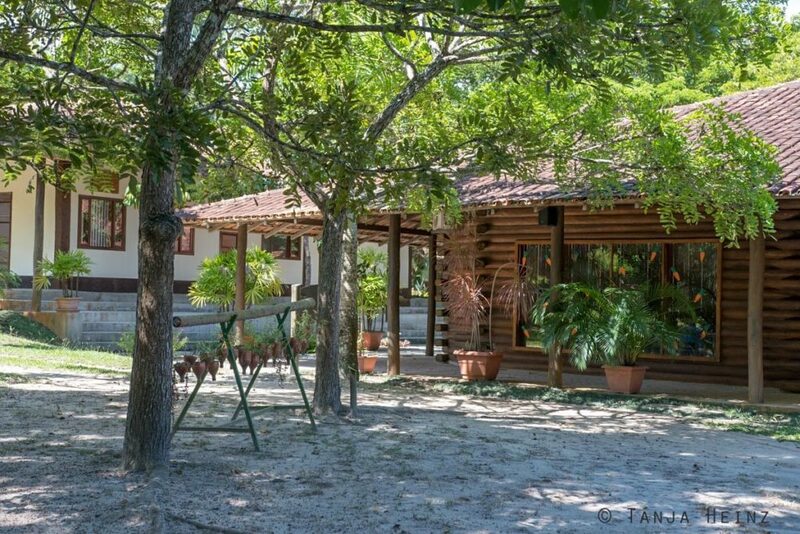 Thus, on those two days in Linhares we could not book a lodge in the Reserva Natural Vale. Therefore, I cannot tell you here my experiences about that, but I can give you some impressions of the lodges. 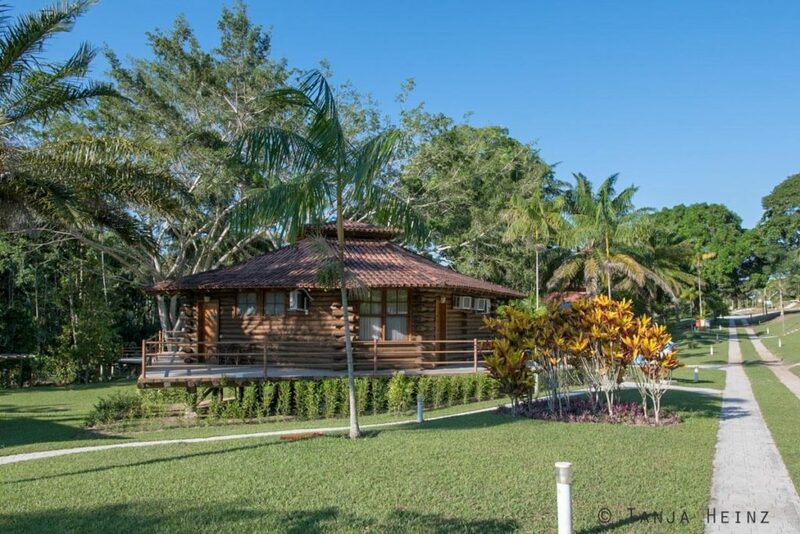 There are different lodges in the Reserva Natural Vale. In the proximity of the lodges there is also a small garden. 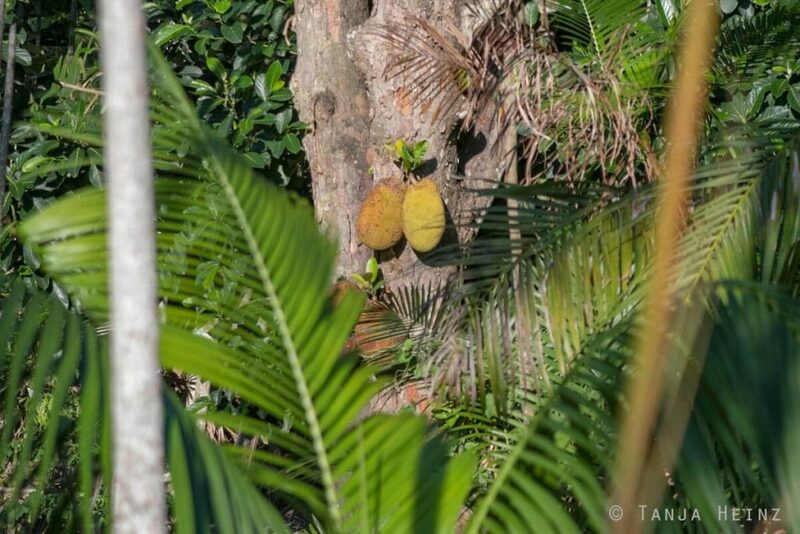 Jackfruit trees seem to be quite abundant in the Reserva Natural Vale. Not to forget. In the evening we saw some more birds. Unfortunately, I was too slow to photograph the parrots. 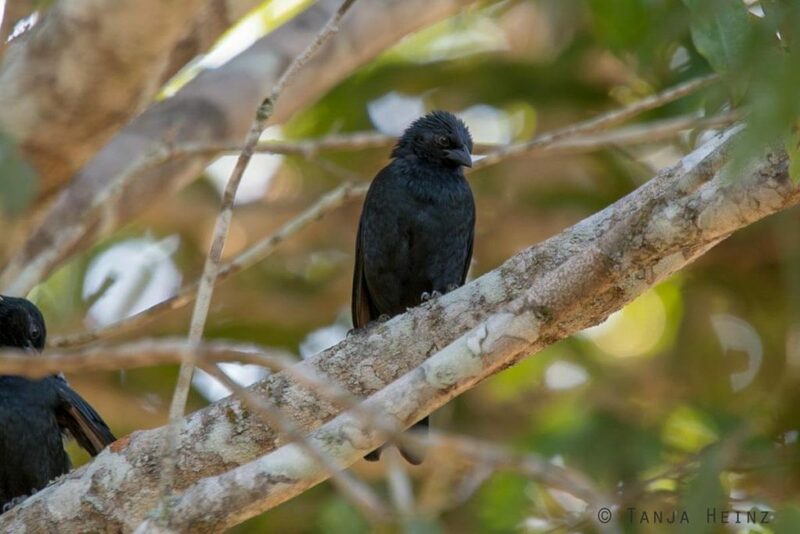 However, we also saw some Chopí blackbirds (Gnorimopsar chopi). … and to another lodge. I would have loved to stay in one of those houses. If I would have stayed in one of those lodges, I might have started my morning quite early to observe as many animals as possible. This place seemed to me too perfect. By the way, we did not meet any other visitors on this day. We just met some staff but no other people. Before I finish this article I want to emphasize that there are some rules to keep in mind when you visit the Reserva Natural Vale. For example, it is not allowed to take pets into the natural reserve and by all means it is not allowed to touch or feed the wild animals. Of course you should not leave any rubbish. I think this should be self-evident. Furthermore, it is not allowed to take any plants, stones, fruits or seeds with you. It is also recommended to wear long trousers and sturdy shoes. The Reserva Natural Vale was a very worthwhile stop on our journey after Itaúnas to Vitória. 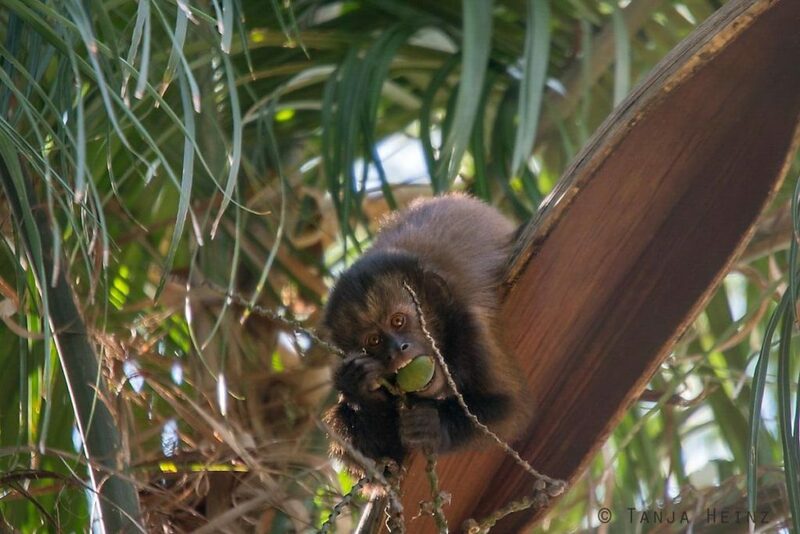 Even though we did not spot so many different animals on that day, we had a great opportunity to look into the life of crested capuchins. 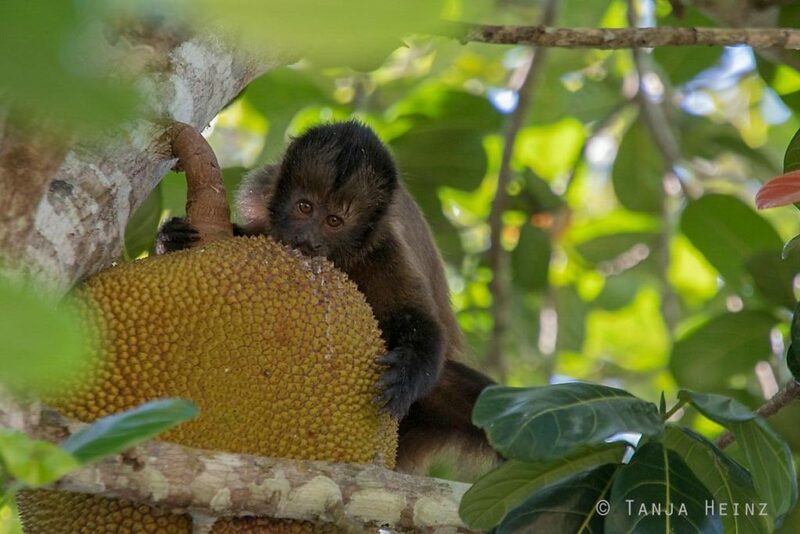 If you consider that crested capuchins are an endangered species, I am more than content that I can tell you about this experience here on my blog. The Reserva Natural Vale is located along the highway BR-101, KM 122. As it was not possible for us to stay in one of the lodges, we had to look for a hotel in Linhares. The town Linhares is also located at the highway BR-101, and thus, easy to reach by bus or by car. The capital of Espírito Santo is about 130 kilometers far-away. If you come from Rio de Janeiro or Belo Horizonte in Minas Gerais you need to drive between 600 and 650 kilometers. As we arrived in Linhares from Itaúnas we first took the regional bus Mar Aberto from Itaúnas to Conceição da Barra (check Practical information for Itaúnas and then a bus from Águia Branca to Linhares. We bought our bus tickets at the ticket desk. We were lucky and got one of the few tickets. However, it is recommended to buy early one of those tickets for this route. There are three busses from Conceição da Barra to Vitória, but four busses to Linhares. You can also buy the bus tickets online. And that is on Clickbus or Brasil by Bus. From Itaúnas to Conceição da Barra we paid 9.70 R$. From Conceição da Barra to Linhares we had to drive with Águia Brance for about three hours and paid 33.30 R$. If you want to rent a car, there are different companies. We made positive experiences with Movida and Localiza. In Linhares we stayed at the hotel Conceição. The hotel is located in the Av. Prefeito Samuel Batista Cruz, 2801 – Nossa Sra. da Conceição, 29190-527 Linhares. We paid 120 $R for one night. We were very content with the hotel. The rooms are clean, the breakfast delicious and especially the staff was very sympathetic. Furthermore, if you rent a car you can leave it on a parking area controlled by cameras. 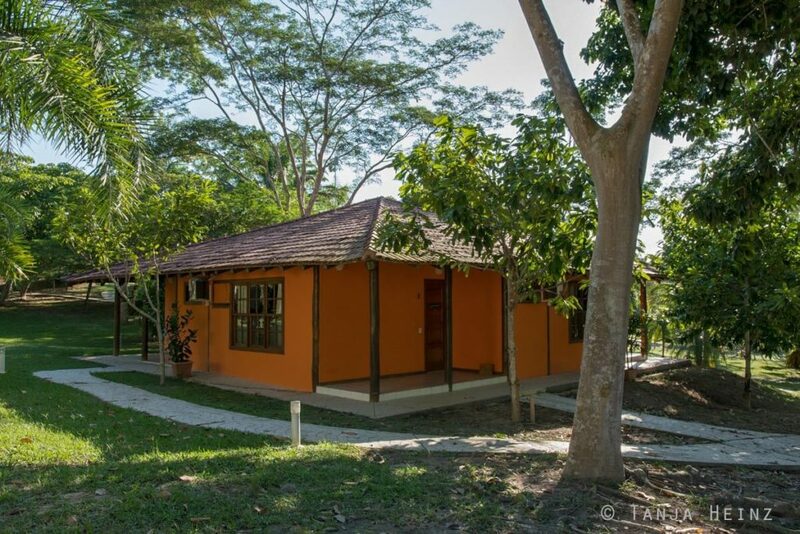 You can find more information about the accommodations in the Reserva Natural Vale on their respective website. In Linhares we rented a car at Localiza. Localiza is close to the hotel Conceição. It takes about fifteen minutes from the hotel to Localiza. The company Localiza is located at the Av. Rufino de Carvalho, 684 – Shell, 29901-504 Linhares. We paid 230 $R for two full days and furthermore 227 $R for petrol. However, if you fill up the petrol by yourself, you pay less money on petrol. We did so when we rented our next car in Brazil.